System Date and Time (Error Log) not correctly displayed and getting lost when powering off the IPC. 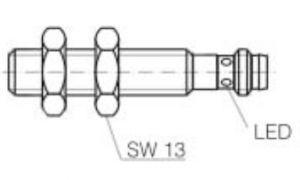 Datasheet for regrooving weld rolls! Can gap too big or inconstant! Exchange of a ceramic Z-bar! If you have a ceramic Z-bar e.g. X7 welder, please not that the ceramic Z-bar is very fragile. In case you have to exchange or to replace the Z-bar, never use a hammer or apply excessive force! and how to access the PC in case of a trouble shooting. Unwelded sections at the beginning and at the end! CCD = concurrent connected data variables. The amount of active CCD is limited. Opening the HMI is using some of the available CCD. Closing the HMI is releasing the CCD again. When you repeatedly open and close the browser, the CCD can still be in use and getting into the limitation. (There is a delay for releasing the CCD when closing the connection). „If a client disconnects from the visu (e.g. browser gets closed), it will take some time until the browser session expires and the CCDs from this client become available once again (session timeout of the scada server: 2 min.). How to solve a CCD exceeded? Close alle open browser connection and wait for >2 min. Now you should be able to open the HMI without error message. How to prevent a CCD exceeded? Don’t open the HMI in several browser simultaneously. Don’t repeatedly open and close the HMI in short time. Don’t repeatedly press reload the HMI in short time. The upper pendulum roller might be not leveled properly. 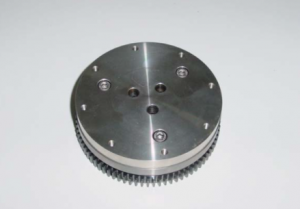 When regrooving the upper disc for example 0.50 mm in diameter, the height of the pendulum rollerhead must be reduced 0.25 mm. This can be done by the M10 screw on the back side. 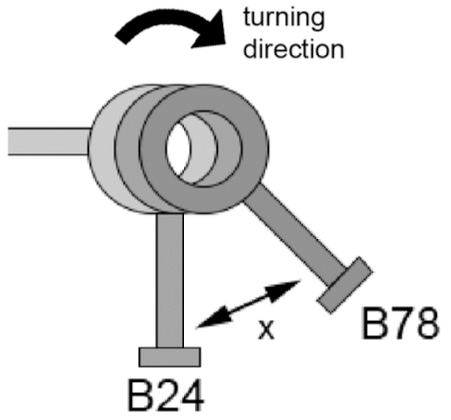 See also in the manual X1 how to reset the upper pendulum rollerhead. NOTE: The description manual is based on a CM X1 welder, but it works very similar for our other welders. ATTENTION: Do not touch the red marked screws! Check the blanc cutting tolerances and blank squareness. Adjust the rollformer (roller shaft clearance and spring pressure) according to the manual. Control if there is a high difference in the tin plate hardness, by rollforming 10 bodies without welding. Put them on the floor in line and compare the difference in the rollforming overlap. Check if the destacking process is going well. Make sure the tin plate is guided tight, and the separating air is positioned well. Control the timing of the tin plate transport in between two transport fingers. Make sure that the guidance channel is properly adjusted. 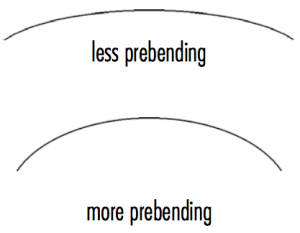 The intersection to the precalibration of the calibration crown is most important. Check the position of each (inside and outside!) transport finger compared to rollformed canbody. Check the offset of each finger pair itself. Move the canbody slowly forward (X1 and X6 by slow mode function) and observe eventual shaking of the canbody until the welding point. If a third finger exists: The third finger must be 0.5 mm behind the upper main pusher fingers! Reset the calibration crown completely. Make sure that each precalibration roller is turning easily! If needed lubricate their shafts slightly and clean the roller afterwards. Make sure that these rollers are as close as possible to each other! The speed must be absolutely identical with the copper wire speed! 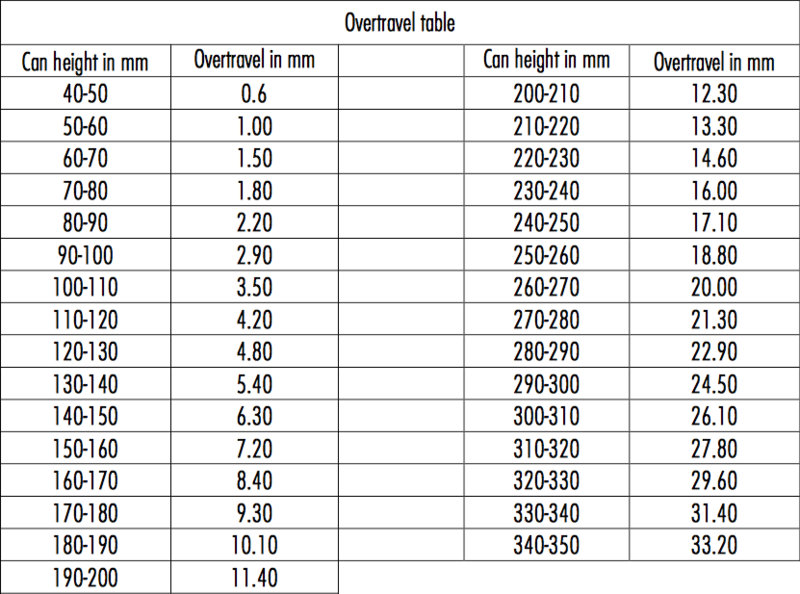 Measure the overtravel: Short can heights shall have 1 mm overtravel. 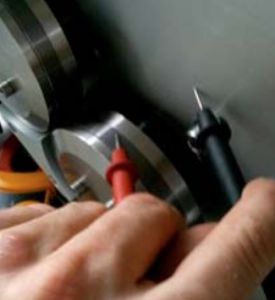 The center of the diabolo roller (equal to the center of calibration crown) shall be 1–2 mm before the welding center. The fan unit can be removed. Check whether the fan is correctly mounted (screwed). The fans can also be removed and cleaned if dirty. Replace the defective fan unit! How to find out that the welding transformer is damaged / broken? Switch off the main switch Q1 of the machine. Wait around 10min before you do anything on the wiring of the pacemaker! The capacitors need that time to discharge!!! Disconnect both welding cables from Pacemaker. Measure the resistant of both cable to earth. If the value is very low maybe the transformer primary side have short circuit to earth or the cables are damaged and make some contact to earth. If it looks ok (endless or very high resistant) go to point 5. Take the welding copper wire completely out of welder. Control that pendulum roller head is lift up. Put a carton or another insulating material between both welding rollers to make sure that you don’t have any contact between the rollers. – Pendelum rollerhead lift up and isolation between welding rollers? Now switch on the external supply. 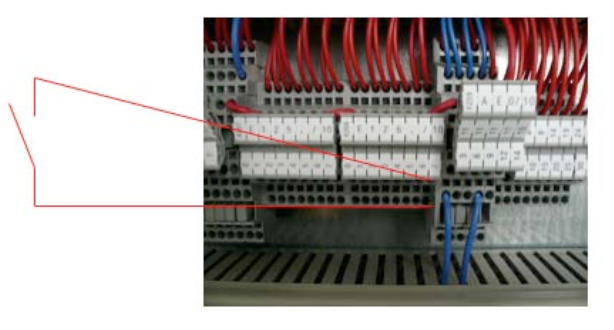 If the 10A fuse breaker does not trip it is a good sign and it doesn’t look like short circuit of welding transformer. To control the output of welding transformer you can measure the voltage between the welding rolls (VAC). The measured voltage is depending on the type of welding transformer. If you change the transformer step this value has also to change. Check the output voltage of each step. Don’t worry if you measure only around 5VAC, the output voltage of welding transformer is a low voltage. Before you change the transformer step switch off first the external supply!!! Between touchscreen and frame there might be dirt or the airgap is too small. Scale of the touchscreen surface is not correct. Contact Can Man use E-ticket. How can I transmit parameter sets from one servo controller to another? Use a common Ohmmeter, as you can see on the picture. 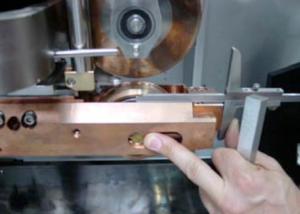 Measure the resistance between left carbide ring and main aluminum plate. The measuring result on the Ohmmeter must be endless! Measure between left and right carbide ring. The result on the Ohmmeter must be endless! This step is to ensure the proper insulation of both rear insulation rings around the taper roller bearings! The picture shows the correct measuring result on the screen of the Ohmmeter for all three test points! Check if the blank cutting is correct. Check if the overlap is correct and constant. Check the welding sensor B6. depending on your version S31 is a pressure sensor or a reed switch! Check if the wire has no dent’s (mechanical damage for example due to too big can gap). Check all terminals at the Pacemaker board. > wait for 5 minutes after switching off the unit. a) remove the welding sensor. 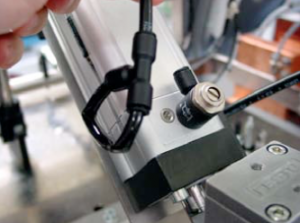 b) start production and cover the sensor by hand, as soon as canbodies are welded. Take off the lower weld arm by taking off the copper plate (on transformer side) and loosen all bottom M5 screws. Clean the surface on the rollformer side plate if needed. Don’t use sandpaper with your fingers. If needed use a grinded plate to support the sandpaper. Grease the T Z-bar and the slot and mount the T Z-bar by the bottom two M5 screws. Don’t tight them yet! Adjust the air-throttle on the weld pressure cylinder to make sure that the piston is coming down as slow as possible! How to check the insulation on the Z-bar? Take off the copper wire completely. If powder tubes are in use, take them off too. Take off the nosepiece, and clean its positioning slot very carefully! Special attention is needed in the area of the front pin. 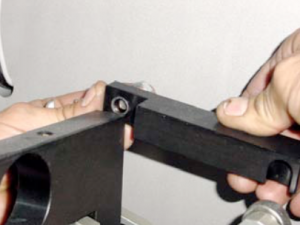 Measure the resistance between lower welding arm and the Z-bar support/long Z-bar. The restistance must be endless. If the measured value is too low, take off one after the other screw underneath the lower welding arm. Attention: Do not take off all screws, the lower welding arm will fall down! Check if every screw has an insulation ring and tube. Blow off all holes by air pressure. Check if the long insulation stripes on each side of the Z-bar are in. If the restistance is still not good, the secondary unit may have somewhere else a contact with the ground. Check the hole secondary circuit. The secondary circuit must not be connected to the ground! The center of the upper roller head must be approx. 4mm ahead of the center of lower roller head. 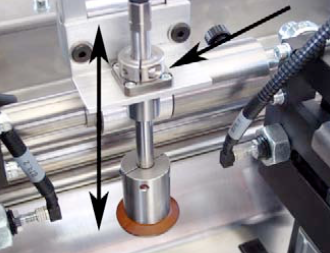 This setting supports the achievement of accurate overlap during the welding process. Switch off the air supply, the welding roller heads should touch each other. Undo the 4 x M8 screws of the motor to reduce the tension of the timing belt. Undo the 2 x M8 screws of the oscillator to loose the connection to the welding pressure. Undo the 2 x M12 screws of the oscillator. Adjust the oscillator, in order to achieve the offset of 4 mm (see explanation in the first frame). Question: Are both wires lined up accurately? If not, undo the oscillator once more to shift it slightly sideways. IMPORTANT: Check if the welding roll touches the oscillator. If yes, adjust the welding roll sideways. The remaining work is, to perform the reverse sequence of the procedure. 1.1. Make sure the whole Z-bar area (also the inner part) is free of small swarfs, steel dust and other. This little dirt can reduce the function of several isolations, and the weld power starts to become uncontrolled! Sometimes more, sometimes less power could be the negative effect! 1.2. Run one or more metals without current, and feel any slight vibrations / acc – decelerations while moving forward! 2.1. Copper wire profile (width not thickness!) 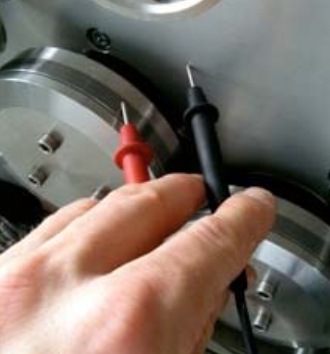 after the profiler must be between 2.20 – 2.25 mm. Use the delivered micro-meter to measure the copper wire, if needed adjust the profiler, see the manual. 2.2. 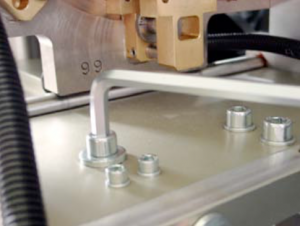 Wire tension: On the main aluminium plate you see an air regulator. Set the pressure to 3.0 – 3.5 bar by turning the handle on top of air regulator. If the copper wire is running, the wire must be well tensioned. You can imagine, if the copper wire has a low tension, he likes to get welded with the metal. If the tension is to high, then the copper wire like to get stretched, and can break frequently. 2.3. 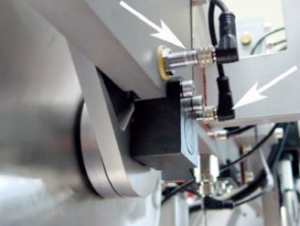 Welding pressure: Close the welding wheels by turning the turn-switch on the panel. Near to the upper welding wheel you see a spring. Close to the spring you see an aluminium welding pressure. The lower end of the spring shows the value on the scale: Should be between 60 – 70 daN. 3.1. Start and end timing weld power: Both potentiometers should be zero. Weld a sample. Now you should have minimum 1 mm unwelded in the beginning / end. If not, adjust S63 and S64 until you see it. Now we are sure that the copper wire can not get damaged due to burned beginning / end! 3.2. Reduce weld power: Probably the weld power is to high. Reduce, and check if the welding is still enough, or the metals start to break off. Go back to origin value. 3.3. Increase welding pressure: Go up in 5 daN steps, and proof the metals. Target has to be, that the zinc – craters around the welded areas are getting reduced. This means that the metals got melted closer to their contact – point. 3.4. 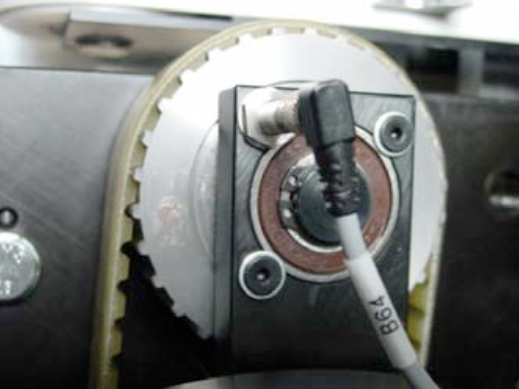 Increase weld speed: Turn the potentiometer 10 by 10 units (not over 30 for galvanized metals! ), and weld some metals. Possibly you may adjust S63 and S64 again. 4.1. 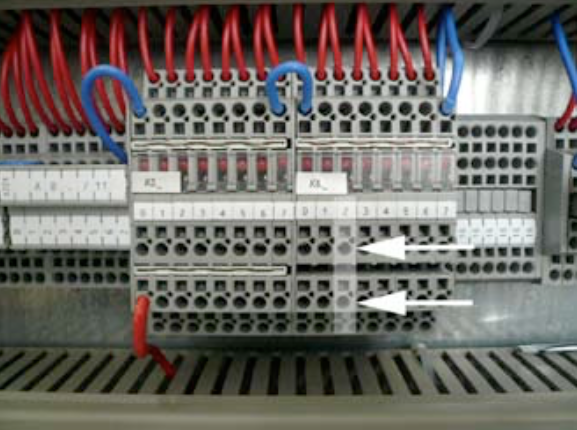 Two copper wires: If you can not get successful, use two copper wires (control also on the second wire the profile! ), and weld some metals. If the wire breaks has stopped, send us more pictures of your last welded metals. Now you can continue your production, while we can rethink next steps to help you. A minimum of marks will always be left on the canbody, because the CM21 is a semiautomatic welding machine with a clamping system. But you can minimize the marks on the canbody, we can show you how. Loose all four allan screws. Adjust the nose/headpiece through the excenter with a screwdriver and then tighten all screws again. => How to adjust below, see in the manual! it, and if the filter is still in. Edges should not be sharp, grind them manually! Above 12m/min micro leakages can appear! => Measure with depth gauge left and right! 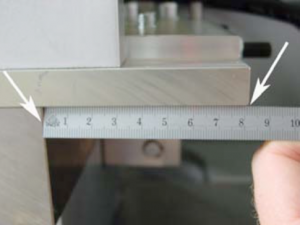 => Measure the isolation between Z-bar and top alu-plate! – Precise guide-bar (underneath Z-bar) must be positioned and mounted parallel to Z-bar => Measure with depth gauge left and right! – Mount the lower weld roll, and set the height: Top point of weld roll (incl. copper wire) must be on the same height with center of Z-bar, or bottom side of upper Z-bar groove! => Depending on form of can body after welding! => Helps to keep the overlap! => Make sure that all 4 pins in the base-plate touch the precise-carriages inside! – Mount the alu-support between clamp-bar and bottom base-plate, and tight all four M6 screws slightly. Move the carriage forward and backward, and tight the screws step by step. => Whenever the clamp-bar is tightened, and the carriage is moving forward and backward, there should no resistance be felt during movement! – Same procedure with inner bottom clamp-bar. Before lock the rear screws, mount the stainless steel plate on the front end of both bars and make sure that both bars are in line! Do not fully tight the M5 lock-nuts! 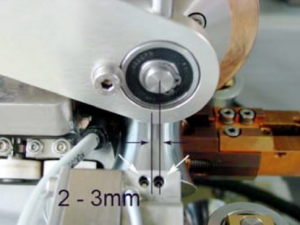 – Measure with depth gauge between front end of pressure link to Z-bar: Result should be 18.2 +/- 0.1 mm. If you have a different measure, change them by moving the grub screws. – Place the outer upper clamp bar, move both sliding rollers from both pressure links into the groove, and tight both M6 screws on the rear vertical support rail. Measure between clamp bar and Z-bar should be 30.3 mm, see also in the assembling drawing. If not yet, loose the M6 screws and move the support again. – Same procedure with inner upper clamp-bar. – Same setting to be done with the cylinder inside. 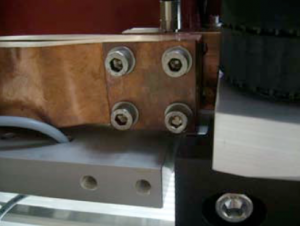 – Finally check the clamping-force efficiency of the inner and outer clamping pairs: Air-pressure between 3 to 4 bars. => The force on both sides should be as equal as possible. Check the unprofiled copper wire in the drum: The copper might be already oxidized. Is the welding current setting as usual, or is there any difference? Check the water flow of the upper pendulum rollerhead, and also the lower welding roller. see also Lower welding arm/welding roller get warm/hot. If the roller is yellow/blue/purple you should exchange the roller. There might be an internal defect. Send the roller to us including a correctly filled out performance sheet. Run the welder after exchanging the roller and/or water flow check, and control, if there are any abnormal hot spots on the secondary circuit. Do you have drawings with dimensions, to built my own nonstop lifttable pallets? CM16 – 300/400 has two pressure gauges. CM16 – 200 works with one pressure gauge and a spring tension system. Try to move the tension cylinder / cylinders by hand back and forward, without air pressure and wire. Try to turn lower welding roll (without wire) by hand. Check the groove of the upper welding disc. Is the wire width correct? 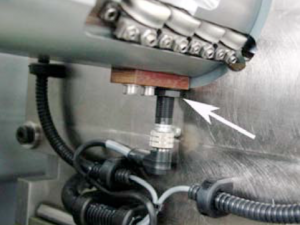 Adjust the pressure of the tension cylinder(s), read for more info here! Check the piece counter in the display. If more canbodies are counted, than there are physically – there is a problem with the welding sensor. Check the welding pressure: Is S31 always „ON“ (LED green)! a) remove and insulate terminal 5 of the PM. Do this only for the trial, need to be reversed afterwards! Are the time settings t1 and t2 correct? Is the weld power limiter switched „ON“? Which mode is chosen? Glueing? Important: Switch “OFF” the sensor before you open the welding pressure! Check whether sensor B1 and/or B2 touch the slant activation plate. The sensor positions/heights are well adjusted, if the piston rod on each cylinder has about 10 – 15 mm remaining stroke left! Exchange the sensors B1 and/or B2. 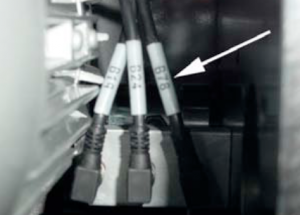 Check whether the plug or cable of B1 and/or B2 have any damage, or are not well connected to the frequency inverters. 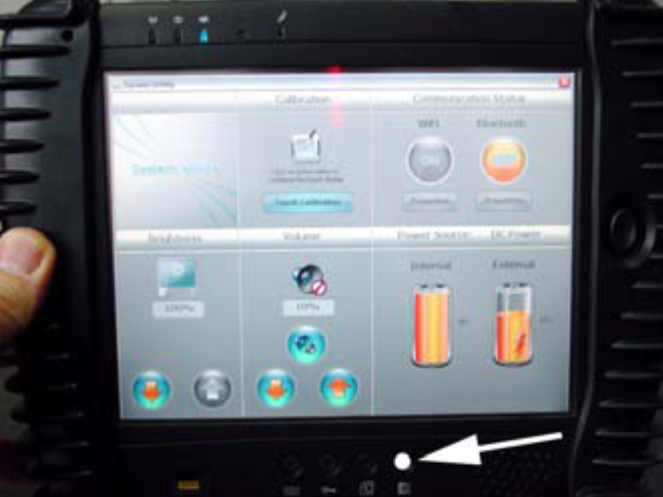 Check whether, there is any error message on the frequency inverters U3, U4 and/or U6. Check the mechanical play between both upper/lower brass guides (one for the profiling unit is mounted on the main alu-plate, the second is mounted on the alu-plate above the rollformer) and the support of the idler wheels. There must be a clearance of 0.3 – 0.5 mm on the whole stroke! Use a feeler gauge to adjust the clearance. Check the profiled copper wire width according manual. If the width is unstable, the main bearings in the profiling unit might be damaged! Take off the copper wire, and turn the motor through the fan impeller on top. If the bearings are broken you probably can feel it, or try to feel the bearing play, by moving the profiling rings up and down. While the copper wire is off, check whether all idler wheels are turning well or not. Check the clearance between both transport rings on the wire chopper according manual. 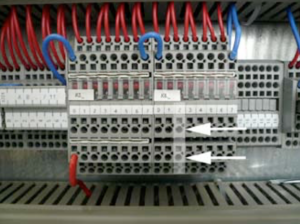 Basic setting: Clearance should have 50% of profiled copper wire width! If your Pacemaker is programed to weld with sine wave (check the IBS), we can change to triangle wave form. Please contact us for further instructions. t2 must be always higher than t1 (t2 > t1). t2 and t1 must be set lower than 1 cycle time of the machine. 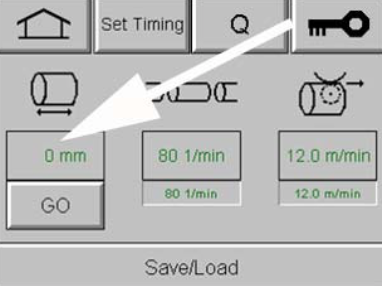 For example, if the machine is running with 300 cans/min the cycle time is 200ms. Therefore, t2 and t1 must be set lower than 200ms. To do an overlap check set “overlap check” to “ON”. The reduced current will be set automatically to 0A. In the same window you have an additional value. 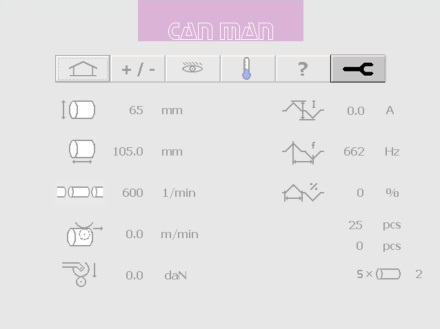 If you set this for example to 10ms you have more unwelded area at the beginning and end of can.NOTE: If you use “overlap check” function is not necessary to switch “Ired” to “ON”. Possible problems, if the overlap function does not work! If you can’t see the value t2 and t1, maybe the pacemaker is running with “Old” mode and not with “CMX” mode. Change in the setup “CT” from “Old” to “CMX”. 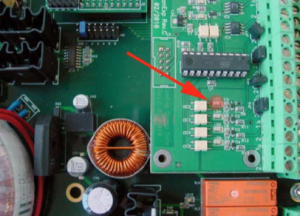 No input signal on input 4 (terminal 7 and 8 on pacemaker board). 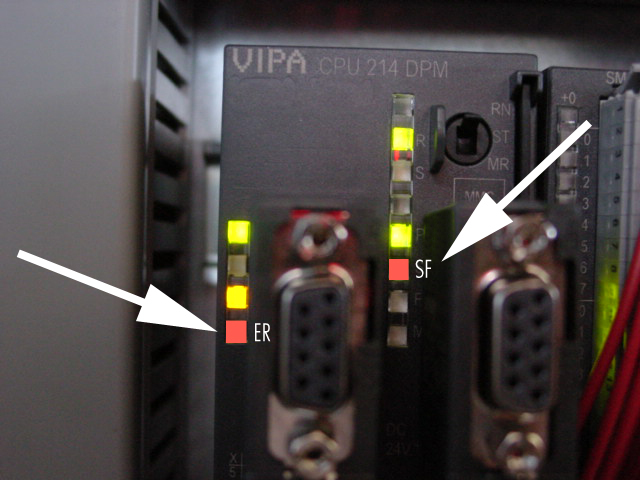 If machine is running, LED behind input 4 (clamp 7 and 8) must flashing. This is the cycle signal to start the timer t2 and t1 for the overlap check. How to replace the profiling ring? Remove all eight screws of the upper and lower unit. Then you can take off the front part and replace the profiling rings. Be careful there are o-rings behind the front part. If a single application is not responding or stops responding when it opens, you can force it to close. If the device is unresponsive or if certain controls aren’t working as expected, restart your device. If the device remains unresponsive or does not turn on (or power on), reset your device. Ensure that the iPad is connected to the USB Power Adapter supplied with the device. Let charge for at least twenty minutes, then see if it starts normally. If there is no image on the screen, press the Sleep/Wake button to attempt to wake the device. If the screen displays a red battery icon, continue charging the device until the battery is fully charged. Hold the On/Off button until “slide to power off” appears. Slide to power off your device. When it is off, press the On/Off button to turn it back on. If you can’t restart your device, reset it by pressing and holding the Sleep/Wake button and the Home button at the same time for a least ten seconds, until the Apple logo appears. Clean the screen with a soft, slightly damp, lint-free cloth. Avoid using the device while wearing gloves, with wet hands, or immediately after applying hand lotion. If you have a protective case, or if you are using a plastic sheet or film on the display, try removing them and testing the device without it. Open the Maps application and double-tap each corner, then the center, to verify that it zooms in to each section. If a specific area is affected in another application, note the location and try to verify touch functionality for that location in the Maps application. Downstacker don’t start reference movement if “control on” is activated or do stop on wrong position. Wrong weld power limiter settings. Tooling sensor B6 (sensor inside calibration crown) not adjusted well. Distance to can body to big. Adapter cable between tooling sensor B6 and cable to control damaged / wire break. Cable between adapter cable and control unit damaged / wire break. Clamp nr.3 or clamp nr.5 on pacemaker electronic board not fixed well. Welding pressure adjusted to low and pressure switch S31 do switch off current. Upgrade over voltage protection for welding pressure switch not installed (Varistor on supply of S31). Voltage peak on 24Vdc can create short dropouts of S31. Welding pressure switch S31 damaged. Contact on welding pressure relay K19 damaged / in bad condition. Contact on welding current on contactor K13 damaged / in bad condition. Waterflow LED is on during start up of production. 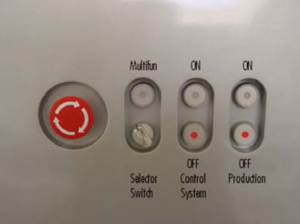 Problem: The waterflow LED is on during start up of production / The waterflow LED do switch off only if the button “production on” is pushed for a long time. 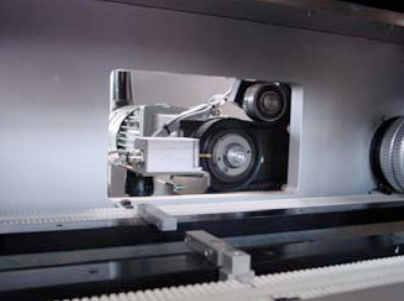 The encoder signal for the production speed of the inverter U7 is coming from a external encoder mounted on the downstacker. On the shaft of this encoder there is a small white plastic gear wheel mounted. Please check the screw of this wheel, it might not be fixed well. > See picture below to find the encoder. Crash in front of the bending wedge blank is squeezed together like an accordion? This is the result of a wrong flexer setting! Open the rollformer and you undo the screw on the right handside of the “Flexer”. Measure with a ruler the actual position of the flexing wedge. 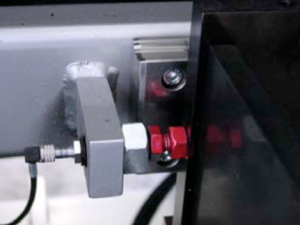 On the other side of the flexer, you can alter the position of flexer with the M8 screw. Choose a lower position for less flexing. With more flexing the sheet comes out of the flexer station with less prebending. If you do less flexing, means that the sheet comes out of the flexer station with more prebending. After adjusting the flexer, you might have to adjust the rounding slighty! For more information regarding the flexer and rollformer setting check our manual book 2 chapter 5.4. 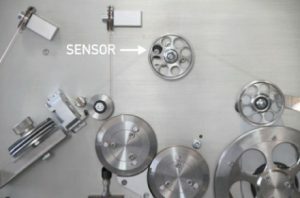 How to adjust the double sheet sensor? 1 or 2 (sender/receiver) sensors are fitted behind the first pair of rollers to recognize double sheets. Sensor in the lower part. 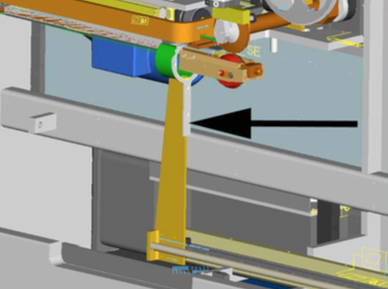 A pneumatic cylinder operates the ejection flap. The double sheets detected by the sensor are diverted into this channel by means of a switch point. The evaluation unit for the double sheet sensor is located in either the control box (illustration) or in the immediate vicinity of the rollformer, on the feeder side. To set the sheet thickness, take a single sheet and lay it on the support rails in front of the first roller pair. You can also open the roll- former and lay a sheet into the rear area by hand. Then close the rollformer again. Now turn the single sheet back and forward in the first roller pair by hand with the help of the belt. The two green LEDs „Power“ and „Relay“ should now be lit up on the evaluation unit. 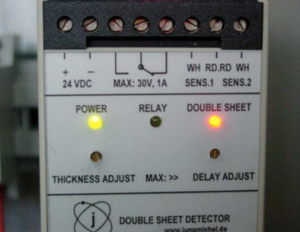 If the red LED „Double sheet“ is lit up, you must carry out a correction. Turn the left-hand screw „Thickness Adjust“ clockwise until the red LED goes out and the green LED „Relay“ lights up. Add 1-2 additional turns in the clockwise direction. Now carry out the same procedure with two sheets (double sheet). The red LED „Double sheet“ should now be lit up. The cylinder should now also be activated. It will be reset again when the sheets are removed. 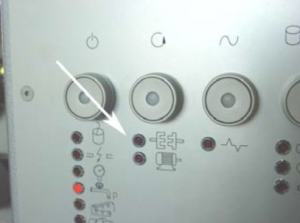 Do not turn the right-hand screw „Delay adjust“; this is used for the delay of the cylinder stroke. You will find further details in Book 5 OEM manuals on the CD. Check the inverter U1 if there is a red LED on. Check if the feeder can be turned by hand easily. Switch the machine off and on and check again. Feeder stops, if sheet stack falls down and the feeder crashes. Lenze inverter current limit is adjustable in parameter C0022. If the inverter reaches the limit it has to stop and go into trip mode. If the inverter is in trip mode then it has to be switched off and on to reset it. This is a sample, where the synchronsation is too early. The blank hit the finger/dog of the body transport. Here the synchronsation is too late. The blank came in alright, but the finger/dog came too early to do the start the transport. 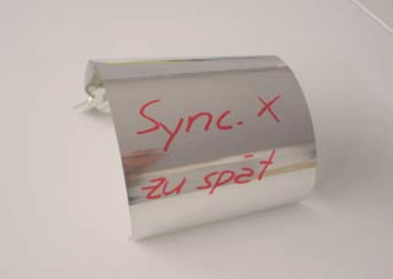 Here a different angle of the damaged blank (late synchronisation). How can I check and adjust the overload clutch? How is the distance between the clutchring and the switch? Trigger the clutch by hand and check if the red LED light comes on. This is the LED, which should light up. 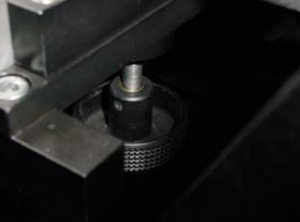 Try if you can hold the polygon shaft by hand tightly and trigger the clutch and therefore an immediate machine stop. Loose both black screws of the guiding channel. Pull the channel to the back of the machine. Now you can see the clutch. The basic setting should be 70 NM – see the red mark. Loose the countersunk screw and take the screw out. Turn the clutch clockwise with a special tool or a drift punch and a plastic hammer. 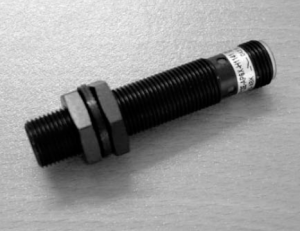 You can reduce or increase the torque by steps off 5 Nm, in order to fit the countersunk screw in. Now push back the channel back into the machine and tighten the black screws. How to change the copper wire from 1.38 to 1.24 mm? Before you change to the smaller copper wire, measure the wire elongation, main welding current and welding pressure and make a note. Make sure that the burrs on the tin-plates are well, try to minimize (damage of copper wire!). 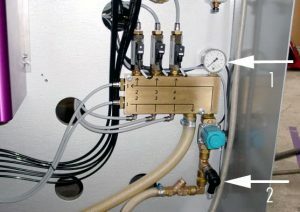 Leave both pressures on the air regulators (wire tension) as they are. 1.8 bar for the profiling unit, and 3 bar for the wire chopper. Width 1.80mm, depth 0.30mm. We offer the correct regrooving tool! 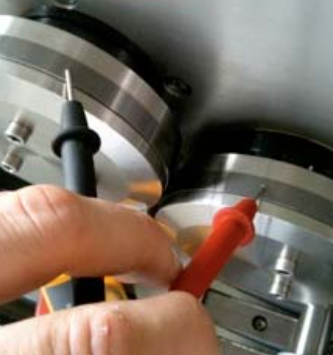 Reduce the distance (gap) between the transport rings of the wire chopper from 0.35 to 0.25mm. Measure the wire elongation after change to 1.24mm copper wire, main welding current, welding pressure and compare with results before! Wire elongation might be slightly greater, but within 2%, no problem. Adjust the tooling with the mandrel. 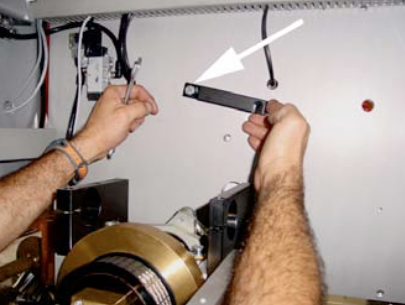 All precalibration rollers have to touch the mandrel slightly. The center of the calibrating crown (diabolo roller) has to be between 1.0 to 2.0mm behind the center of the lower welding roller! Please measure carefully. Check the angularity of all 3 axes of the main calibrating tool plate. Check the height of the front carbide Z-bar (nose- / headpiece). If it is too deep, then it could cause a different overlap. Check the cutting tolerances of the tin plates according our specifications on our webpage. Adjust the welding pressure on the precise air regulator to 2.8 – 3.0 bar. 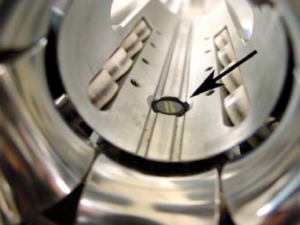 Check the wire gap within 5 – 10 canbodies: The tolerance should not be higher then 1mm. Control the tin layer on the upper and lower copper wire, it has to be in the center. Rollforming has to be parallel, and the blank edges has to be around 5mm overbended. Check the overtravel according the rule on the carriage. Check whether the idler wheel in front of the lower welding roll is in correct position, or whether the circlip is missing (X-plane only)! I heard you have a new 50 pages maintenance manual with several checklists for daily, weekly, monthly and yearly tasks. Drives switch themselves off without any actual logjam (LED: overload clutch disengaged). Recalculate correct speed (see manual CM16 / chapter 6.6). Set welding speed 2-3 m/min higher than calculated. If this then works get in touch with CANMAN. The guide tool is set too narrow. Reset guide tool using the calibration arbor. Upper inner transportation finger is brushing against the catch rail plate. Insert brace is brushing against the catch and guide channels. Synchronisation is not correct (see manual CM16 / chapter 7). Re-adjust the safety clutch slightly – ATTENTION: max. 10% higher! longer engage correctly and is faulty (contact CM). Switch off the machine completely and turn the crank by hand. There must be no increased resistance at any point. Loosen belt and turn once more (possibly a problem with the motor). Suddenly no welding, but you can still hear the current! The PM doesnt show an error and the modulation is okay. With the spring loaded welding pressure system, the upper welding roll should be pushed down by the air pressure cylinder. 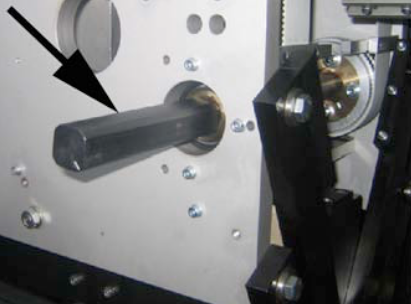 When the welding rollers are closed, the cylinder should be released and should not additionally pushing the spring. Because then the welding pressure will be too high. Doublecheck the cylinder settings for the lift-up and the drop-down position of the welding roll. Adjust the setting, there might be a loose setting screw! 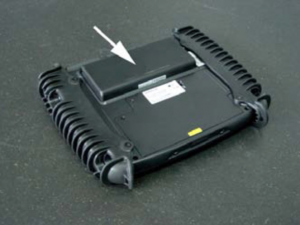 How to change belt dogs and the body transport belt? 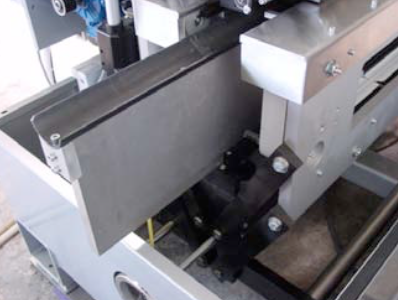 Turn the polygon shaft until the belt dog is easy accessable from side of the machine. Loose the two screws on each belt dog. 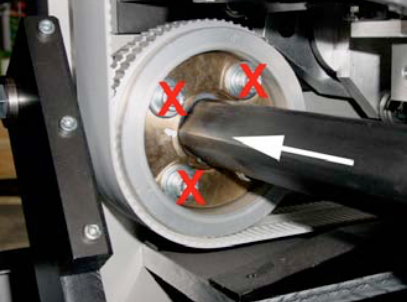 Then replace the belt dogs, be careful that belt dog, is correctly placed in the timing belt, as shown in the picture. If you need to place the belt dogs, in a new location, due to a damaged belt area, make sure that the distance x is always the same around the entire belt loop. Also make sure that inside and outside belt dogs are corresponding to each other! Turn the polygon shaft until a belt dog is inline with reference 3. Take off the bracket (see picture),in the back of the front plate. Then mount the screw loosely to side plate of the synchrostar unit. Slide the slot of the bracket around the crank handle and tighten the screw. Now you have to release the tension of the synchrostar belt, by loosing the M12 screw. Then release the tension of the body transport belts. The white arrow shows you where you can release the tension of the outside belt. The inner belt has the same feature. Untighten the two set screws. Loose sligthly the three M8 screws (1) first, then undo the M8 screw sligthly too (2). Now you can release the clamping force by turning the M8 nut (3) a little bit. 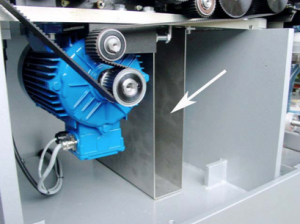 Now, you should be able to move shaft to the front of the machine and to replace both body transport belts. Do not loose any other screws, as for example the red marked ones in the picture. After you have replaced the body transport belts, follow the above instruction in the reverse sequence. 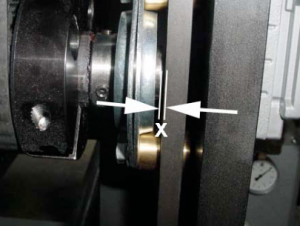 When you push back the polygon shaft and clamp it, make sure that you keep a clearance of x=1mm as shown in the picture. How to exchange the Z-bar? 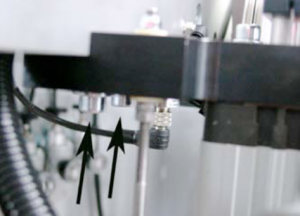 Remove the guiding channel to side of the machine. Then remove the wire from the welding rolls and unlock the tooling plate and slide it to the front. Remove the 8 screws (see arrows) from the welding arm. Be aware that the screws at the inside are shorter than those at the outside. Do not loose the two o-rings in between. Then undo the eight screws from the cover insulation. Get somebody to assist you to hold to welding arm (heavy). Remove the Z-bar from the welding arm and clean the welding arm with a dry rag. When you mount the new Z-bar with the insulation, make sure you put some grease on the surface of both insulations and align the Z-bar centered with the depth gauge to the welding arm. Put also some grease all around these insulated screws. When you mount the welding arm, do also align the arm properly with the depth gauge to the window. When you mount the welding arm to machine, make sure you are using the shorter screws for the inside! Otherwise the ceramic guiding might get damaged. Do not forget the two o-rings! We hope your replacement work was successful. Thank for your support! Check the clearance between bending wedge and upper rollformer shaft. The clearance might be bigger than 0.10 mm! Undo on each side the two M5 (black flat head) screws, and turn the whole bending wedge support left and right, until you reach on both side the needed clearance. Lock the screws and double check the clearance with the feeler gauge. 0.05 is too small and 0.15 mm is too big, depending on the thickness range of tin plates of course. When Power ROLL is in use, there is a 50µm filter cartridge in a white body, normally placed on the delivered chiller. See also in the manual (chapter 7) how often the filter should be exchanged, and after what time the emulsion has to be exchanged!When mercury rollers are in use, there is a little 250µm filter mounted in the inlet of the water station. Open the filter and blow off the insert til the meshwork is clean. The water pressure on the water station must show minimum 5.0 bar! The flow meter of the lower welding roller must show minimum 5.0 l/min! Take off the water tube in the outlet of that cooling circuit, and measure how many liters emulsion/water is coming out per minute. Compare that value with the adjusted value on the flow meter. The value of the water flow should be around 1 liter higher than the flow meter, or the flow meter should stay at least at 5 l/min. 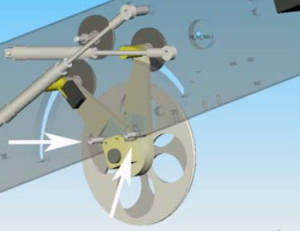 Take off the X-Plane welding roller support completely, and check whether both round connections (center of rotation) between arm and X-Plane are correct positioned! If they are turned, means positioned wrong, they may reduce/close the water circulation between arm and welding roller!Put the X-Plane and welding roller back, and blow out the whole circuit by compressed air.Take off the water tube in the outlet of that cooling circuit, and measure how many liters emulsion/water is coming out per minute. Now the welding arm and roller should remain chilly again. Adjust now the flow meter to 5.0 l/min and start the production. If everything is correct, the production will not be stopped. Adjust now the flow meter to the max, means completely to the top, and try to start the production. There should occur an error message on the touch screen, showing that this cooling circuit has not enough water, and production can not being started. 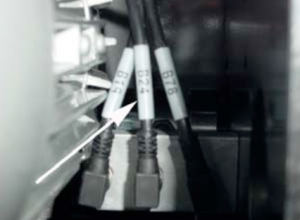 Cable break in motor cable or extension cable. replace extension cable or replace motor with fixed cable. NOTE: Maintain minimum bending radius of 25mm for the cable! 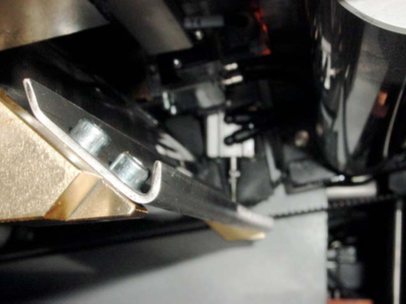 The position of the infeed arm might have shifted, due to a crash or loose screws! double check the correct position. 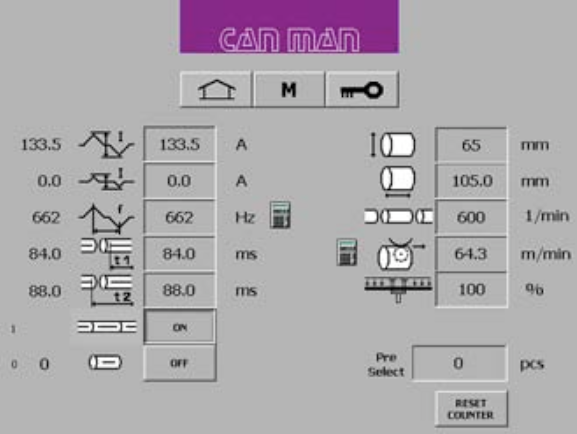 Therefore insert „0“ to the can height setting and press „GO“. If you ever changed the overtravel setting in the tuning level, set this value to „1“. Now measure the distance from the infeed arm to center of the welding roll. The correct reading should be: 216 mm! With this reading the canbody will have 1 mm overtravel. 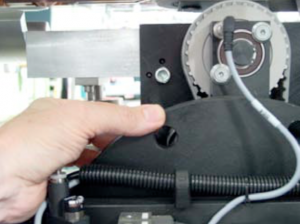 Find the correct position by undoing the four fixing screws of the infeed arm! This adjustment described above, is only applicable for the old type of CMX8, since the new version has a slot to prevent this issue. No supply of a slave on the bus system. Check supply of all slaves. Address of slave on Profibus is wrongly adjusted. Check the linmot controller. The correct setting you can find on the wiring diagram. Wrong position of the switch for end resistant on the bus plug. Check all switches on the complete bus system. Follow the cable seriously from PLC to last slave. First plug and plug of last slave must be set to ON, all other plugs to OFF. Set the roll clearance to 30-50% of the sheet thickness. Do you have red springs in use for the upper front roll? reduce the spring tension and check the spring color. Tension the red/black springs with 3 – 3.5 revolutions. Check the roll clearance with a dial indicator. Provide us with the nameplate and a photo of the motor. Change the frequency inverter of the rollformer motor to 87Hz technique. This is the new standard of the CM X8. 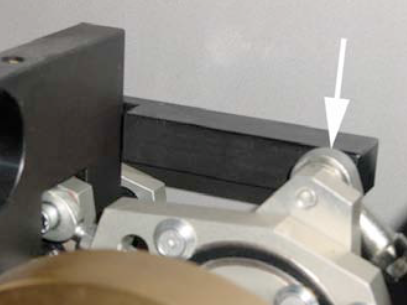 Do you have a two-piece catching plate around the lower welding arm (Rollformer 420/540)? This helps to guide overrounded canbodies back into the Z-rail. This also helps to guide overrounded canbodies back into the Z-rail. Catching canal: Is the interior measurement of the two shells corresponding to each other? If the interior diameter is too big, too open-rounded canbodies might not be correctly conducted into the canal. Does the canal flap works properly? The flap might even touch the canbody, which is being welded. Only the a perfect adjusted flap fulfills their purpose. 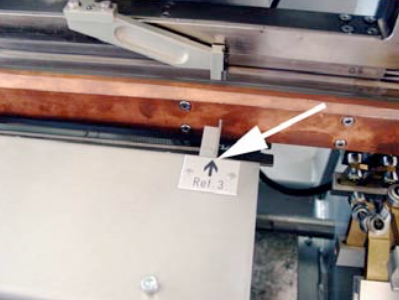 Check the upper rollformer plate: Use a dial indicator to see, if there are back and forth or up and down movements. Problem with the touch panel data file, which is loaded on the memory card. Exchange the memory card. 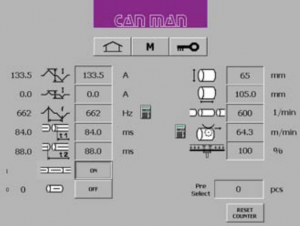 Before CanMan will send you a new card, we will store your parameter (prior shipment of your X8). The touch panel itself has a fault. NOTE: all timing settings are stored on the PLC and not on the memory card. wait for 5 minutes after switching off the unit). Check the welding pressure: Display > 30.0 daN! Check air supply for the cylinder. 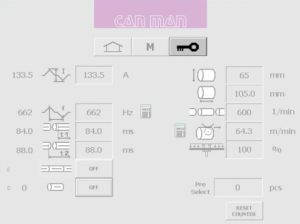 Eject cylinder must push the canbodies inthe center, the can must move verticallyaway from eject cylinder. Second light barrier is always ON.Sensor dirty or bad adjustment. LED on light barrier must be ON without can, OFF if a can is detected. Control wiring of first and second light barrier according electrical diagram. Make sure the faulty can is really ejected, means does not touch the edge of the bin and jumps back. => Use a fixed channel underneath the eject station, instead of a mobile bin! Adjustment of the light barrier distance to eject cylinder might be wrong. Wrong adjustment of the transport belt speed. The ejected can should whether touch the can before nor the following. 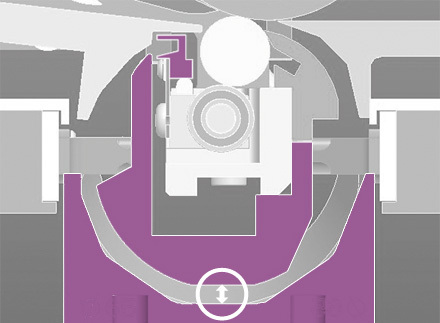 Place a canbody between the second light barrier and check the LED „LD3“ on the eject print (inside the Pacemaker). The autoreset needs to be “OFF”. Therefore the can memory will not be reset automatically. Check, if your hardware parameters are set correctly, according to one of the three layouts. How to reset the calibration crown of the X8? Take off the crown and mount the setting mandrel. If the mandrel does not fit, first move the accordant diabolo rollers a bit out of the crown center! Adjust now the top 2 diabolo rollers first. Reset the top diabolo roller first. Only the center of the diabolo roller must touch the mandrel! Now reset the other diabolo rollers. Only the center of the diabolo roller must touch the mandrel! Take care, that the clearance between all diabolo roller ends are equal. Make sure that the gap between both roller ends is as small as possible, with other words, move them towards the “welding center”. Make sure that all spring tensioned pre-calibration rollers are touching the mandrel and have a preload of about 0.2 – 0.5 mm! no gauge available except operators sense. The top pre-calibration rollers shall touch the mandrel or have a clearance of max. 0.5 mm! After you mounted the calibration crown back into the welder, make sure that the level of the crown is parallel to the bottom plate. Measure the distance left and right with a rule, and set the height left and right within 1 mm. Read also this checklist here. Wrong direction of rotation of the vacuum pump motor (only when machine has been disconnected from the power). Clogged filter of the vacuum pump (or in the vacuum hose / tube). Clogged bores in the sucker cups. Wrong vertical adjustment of the sucker bar. Badly cutted blanks with lots of burrs. LED not “ON” when production “ON”. Too tight adjustment of the blank magazine. Worn sucker rod or worn seals/bearing in the vacuum housing. NOTE: Only applicable for the model X8-350! What is the correct position of the calibration crown? behind the center of the pendulum roller head. he screw with the lock nut has a red seal and must not be changed. This is used to fix the position on the longitudinal axis of the tool carrier with regard to the welding centre. If you have to change the setting of the calibration crown, you have to loose the lock nut and adjust with the M10 screw accordingly. Clean the surface with a moist cloth. Check also for scratches or damages. Check if the frame presses on the touchscreen. The active surface is bigger than the screen. If necessary bring some clearance between the frame and the touch. If you tip simultaneously on two spots, the touchscreen can block for a short period. Wait for a couple of seconds. What is the correct setting of the sucker unit (elevating platform version)? In it’s uppermost position, the sucker should lie slightly above the sheet inlet, between the first pair of rollers. If the setting has to be changed, the screw on the setting ring will have to be loosened. Further information regarding the exchange of sucker unit of the feeder can be found in Chapter 6. Changeover. To perform a good timing, the best way is to disconnect the air hose of the cylinder and block it. In that way you can manually lift the sucker unit and find the correct timing. If you move down the sucker unit to the blank, the vacuum will be activated. Then move up the unit together with the blank until the vacuum breaks. The correct timing of “breaking” the vacuum is, when the blank just arrives between the roller pair. X- series and is therefore not adjustable. If you have, due to whatever reason to adjust this setting, first make sure what the result of the offset is. To adjust this offset, you have to loose the two M8 screws of the holder from the welding pressure cylinder. Additionally you have to loose four M6 screws (1- two are shown), which are fixing the plate (2). 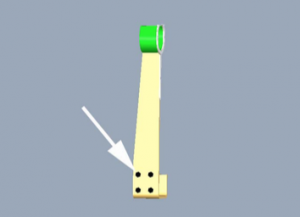 Now you can shift the position of pendulum roller slightly in the various hole play. Do not make any adjustments on this shaft! Double-check the offset value again and tighten all screws securely. 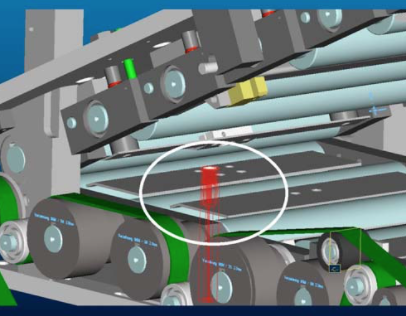 The sensors B1 and B2, which are mounted to main machine plate, need to be readjusted. Here you have another viewpoint of the two sensors. 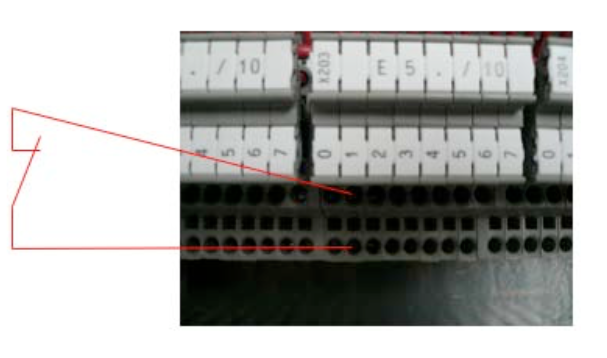 The reason, why the wire is still running is, that a distance “x” in the picture is too big. Therefore reduce the clearance for both sensors B1 and B2 too a minimum of 0.1mm. This might be possible, because the triggering is inverse (this means with a minimal distance to the sensor, it results a max. frequency. Check the distance of the analog sensor (description). If this doesn’t help, place the programming display on the converter U6 and change the parameter C26 from –50% to –55%. The positions of the screws for the sensors B19, B24 and B78 have been set in the factory, and should not be adjusted. If something has changed nevertheless, you should follow the detailed description below. Three sensors are located on the right near the feeder drive M8. 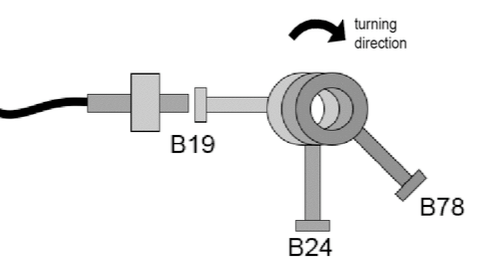 Sensor B19 (left) controls the vacuum valve of the suction beam. 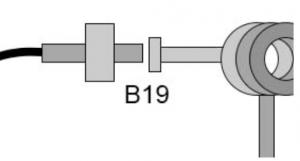 After „breaking“ the vacuum, the position of the screwhead for the sensor B19 must be active. Therefore the position should be chosen between „breaking“ the vacuum and the lowest position of the sucker unit while traveling down. The correct setting for B19 – active, should give you distance of approx. 25mm from center of the hole to the block. 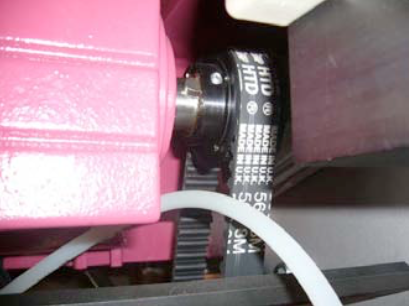 A hexagonal screwhead activates the sensor B24 (center), which then opens the channel flap. 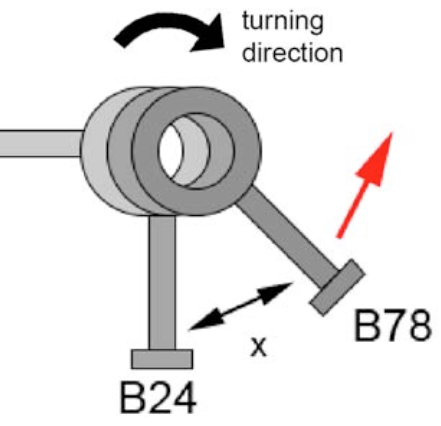 A hexagonal screw activates the sensor B78 (right), which provides the timing for the feeder (synchronization)! This signal comes from the PLC in the elevating platform version, so no B78 is used in such an application. The „active“position of the screwhead for the sensor B78, can vary depending on the rollforming speed. 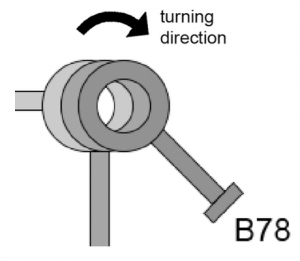 The signal of B78, always follows the signal of B24, that means that the flap must be closed (B24), before the body pusher starts (B78). The distance, resp. the angle between the two screwheads is fix (at approx. 25 – 45°). With a higher rollforming speed, or if the blanc feeding is too late, or you get a damaged blank beginning, you have to move both screwheads slightly clockwise. With a lower the speed of the rollformer and jams the blanks from the backtravelling body pusher, you have to move anticlockwise. Make sure that the “activator” screws are tightened and locked and not touching the sensors. A wrong setting of one of the sensors (B19/B24/B79) will not show a direct related error message. An incorrect setting of B19 will cause destacking problems and the incorrect setting of B24 & B79 will cause synchronization problems. 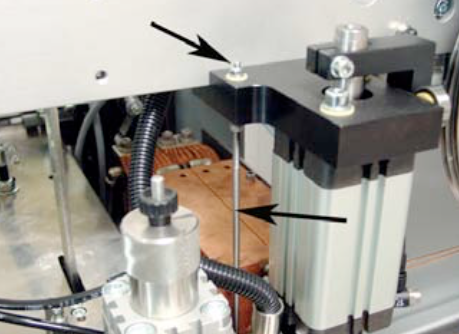 While pushing the key wire drive manual, the wire tensioning cylinders running against mechanical end stop. Message ”Wire break” is displayed. The analog sensors (B1 & B2) are not properly adjusted. See the following description. groove worn out, recess the welding disc. This can only happen on higher can heights. The canbody to be welded, is extending with its back into the rollforming area, while the next tin plate is coming out of rollformer and touches the backside of the tin plate. 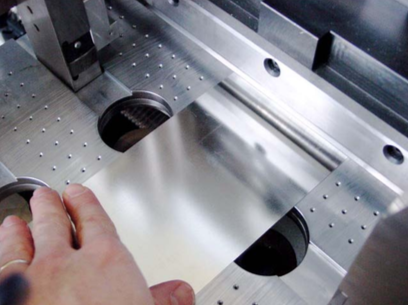 The sharp edge of the rollforming plate scratches paint away. This paint is being welded thereafter in the seam. Reduce the Linmot cycle time, but not less than 500 ms (access with password customer 1). The can is now pushed faster into the welding area. This might already solve the problem. Increase rollformer speed if necessary, to reduce the rollforming process, because of delayed feeder. Try step 2 and 3 til ok. The machine / control is going “off” as soon as the wire starts to run or rather the water valve is opening and the error log shows sometimes “Water pressure too low” or sometimes “Flow switch 1, 2, 3 or 4”. Replace water filter or increase water inlet pressure (min. 5 bar at the inlet). Check / adjust water pressure switch; see picture below: manometer (1) / pressure switch (2). WARNING: Do not adjust pressure switch unless synchronized / confirmed with / from Can Man! The last can is not welded at the end, sometimes the canbody remains in the crown. 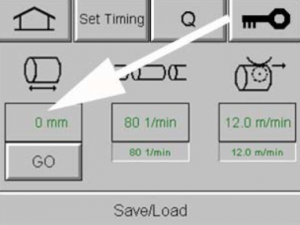 Delay off time drives has to be increased (access over spanner symbol, key symbol, customer password, key symbol, time settings, drives off delay). Check the overlap in the end, maybe overlap is too small, and it looks like not welded. Also possible: time “jam in weld section” (longest canbody?) did stop the welder, error message should appear in the touch screen! The calibration crown is adjusted too close (too much overlap). This can cause a high resistance. Switch of machine and move the slider by hand. It must move smoothly. 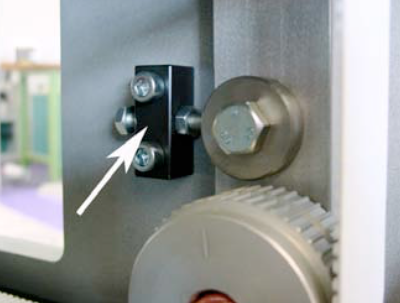 Slider dirty – since the slider of the linear motor contains strong magnets, remove dust or small metallic particles from the slider (see picture beside). To do this, remove the front cover. Check if the cylinder is worn, therefore check for are air leaks in both positions and to much backlash between piston rod and cylinder body. NOTE: If you did remove the bracing, reassemble correctly. Check the insulation and tighten the self-locking nut only slightly, that the connection can adjust itself. 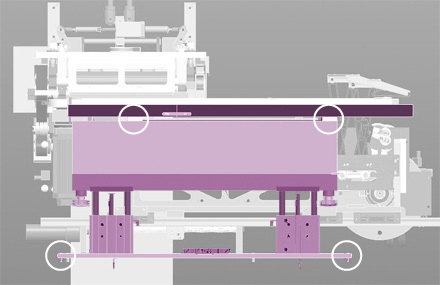 During production the canbodies face unequal body offset. Important: All precalibration rollers must turn smoothly, not one should be blocked. 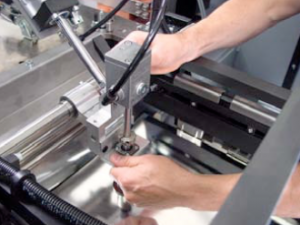 Guideline: The higher the production speed, the more difficult to control body offset issues! The setting of the first, second and probably third spring tensioned rollers before the diabolo roller crown may vary in setting. 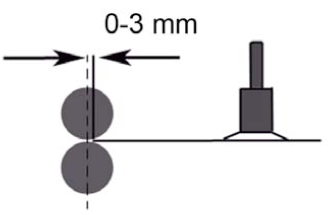 Basic setting – first, second and – depend on can height – also third rollers should have 0.10 mm movement. If the body offset still remain, start to undo all the nuts of the first pre-calibration rollers by a sixth turn, and so on. If the grooves are full, clean them by sandpaper 400 or higher. For better cleaning take off the lower welding arm completely. Switch off the chiller before start to dismantle! Check the insulation according manual – How to do an insulation check (yearly task)? 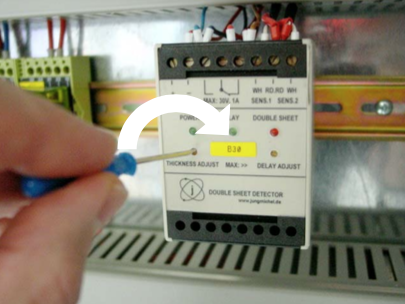 Check whether the secondary circuit – lower arm side – is connected to ground by a separate green/yellow cable! What to do if positioning drives of QuickCHANGE™ Plus (automatic height changeover) does not work? in the magazine, the weight is too high! Maybe gap between can body and sensor to big? Maybe wire break and no signal on plc/pacemaker. Check cable and plug! 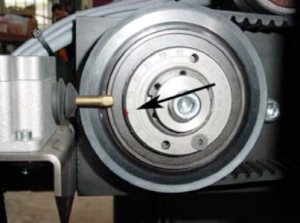 Adjust the pressure of the tension cylinders: Cylinder below wire profiling unit requires 1.6 bar. Cylinder (behind main alu-plate) for wire chopper unit requires 2.0 – 2.4 bar. How to change the bending wedge on X1? 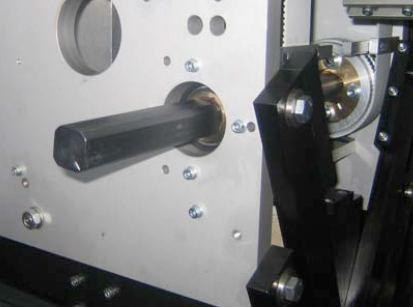 Take off the upper rollformer shaft / bending wedge unit completely. Release first both spring pressures completely! Change the bending wedge, take care that the roller is not falling by mistake onto carbide wedge! Put a rag between. Change the support bearings below lower rollformer roller first if damaged! Important: Left and right of both bearings a shim of ø 8/14 x 0.5 mm is needed, to avoid that outside rings of bearings are touching lateraly on the hardened support and becoming hot! Control whether the little shaft (into the needle bearings of lower rollformer shaft) in the right side plate is really fixed well or not. Mount the lower rollformer roller completely, and measure the clearance between roller and bearing: 0.02 – 0.05 mm. Important: If no clearance can be measured, take off the hardened support with bearings, and grind the lower side slighty until above mentioned clearance 0.02 – 0.05 mm has been reached. Mount the upper rollformer shaft / bending wedge unit back (use only bores in the middle! ), and move the bending wedge about two turns up. Avoid that the wedge touches the lower shaft after closing the rollformer! Don’t tighten spring pressure yet! Close the rollformer, and hold left and right a feeler gauge 0.10 mm between both rollers. Close the rollformer slowly step by step. Take care that bending wedge will not touch lower roller! Reset the height of upper roller until you can move out both feeler gauges easily. 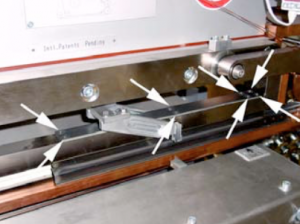 Now open rollformer and measure the clearance between bending wedge and roller. It should min. 0.3 mm. 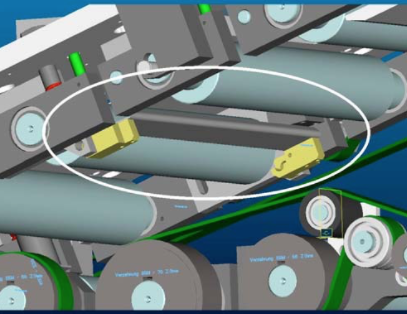 Double check ones more whether a proper clearance between lower roller and bending wedge is there. 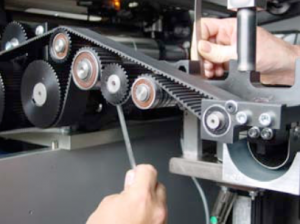 Close the rollformer completely and reset spring pressure and set roller clearance correctly. Now the rollformer is ready for first rollforming trials. 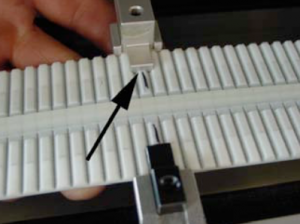 One blank-corner is damaged when touching the inner catch rail. The damaged/bended corner is touching first the inner catch rail. The inner catch rail looks like a hook and will be found underneath the lower rollformer shaft on the catch station. By changing the horizontal level of the catch channel slightly, the roll-forming direction of the tin plate will be changed/affected, and the whole tin plate edge should touch the catch rail equally. 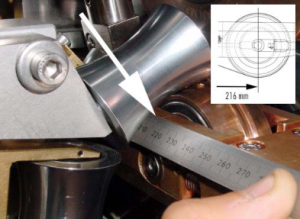 Measure the inner left and right distance between the hard-chromed guidance channel and internal hard-chromed guide-shell (around lower rollformer shaft). The left/right measures are most probably not equal. Try to correct one of the distance until both measures are equal. If you are not sure how to correct, feel free to contact us via the online support system. 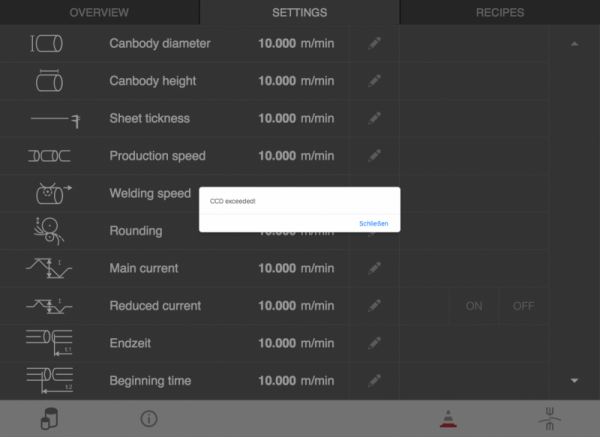 Report all steps, new or different settings, old and new production parameters (can size, cpm, weld speed, weld current, weld frequency, current wave-form and transformer step) for an easier overview and follow-up! Open a new ticket and add your document! 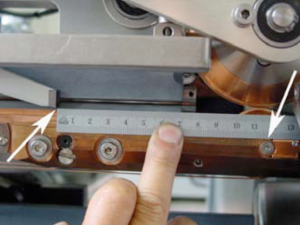 Note on which tin-plate parameters (thickness, hardness, tin coating inside / outside, rolling direction, BA or CA, supplier, printed or not) such faults occur, and on which tinplates not! Measure the tin-plates and report if out of tolerance! Not conical and best roundness must be reached! 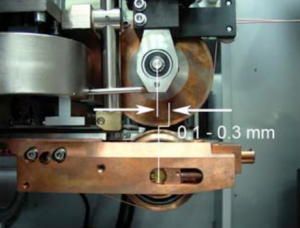 The width of the profiled copper wire shall always be 0.05 mm smaller than the profile-groove in the weld rollers! Measure the width of the profiled copper wire within around half a meter on several position, and note the variations. Maximum difference of 0.05 mm are allowed. If you measure more, check the concentricity of the profiling rings. 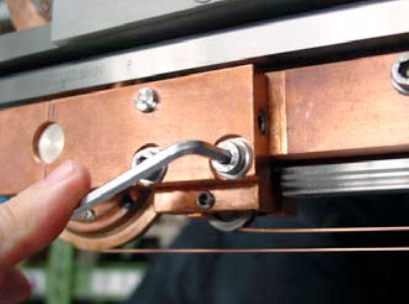 Change the copper wire profiling rings or idler/guide wheels if the surface of the copper wire shows a damage! To avoid unexpected heavy weld faults it is recommended to implement the total piece-counter and the regrooving interval into the production order! Upper weld disc ø 90 mm to be regrooved after 3 mio cans (interval depends on, type of welder, type of weld roll and welding speed). Lower weld roll ø 62 mm to be regrooved after 2 mio cans. Total piece counter at production start at 28 mio welded can bodies, upper weld disc has been regrooved at 25 mio, therefore to be regrooved now! Lower weld roll regrooved at 27.5 mio, therefore to be regrooved at 29.5 mio. After every regrooving weld roll and / or z-bar must be repositioned: Use the correct to reset the lower weld roll and/or nose-piece, and the upper welding roller! A dirty z-bar may not be well insulated, therefore the risk of wear is higher and the weld current is flowing over z-bar and tin-plate to the weld center! Note: The insulation of the secondary circuit should be controlled yearly! 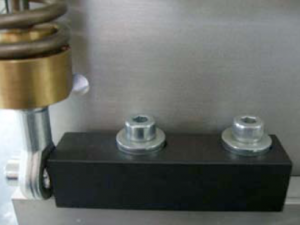 Non turning pre-calibration rollers can create body-offset and unconstant can gap! 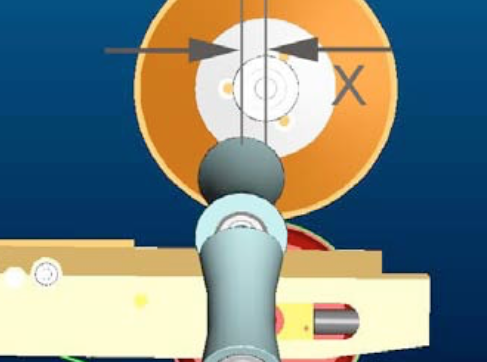 The center of the crown must stay between 3 – 1 mm before the center of the lower weld roll (in weld direction seen). The position and speed of the exit conveyor (all conveyors which transport the can body out of the weld center) must be aligned perfectly. Both belts have to touch the can body similar. The direction of the conveyor must be absolutely parallel to weld direction! A driven diabolo roller must run the same speed like the copper wire! That means that all mechanical settings are correct! 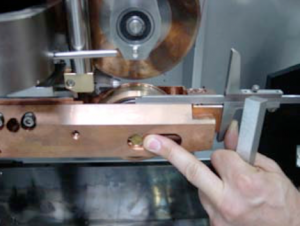 Make sure that the air-pressures for the pneumatical cylinders are set correct, or the copper wire is in the right groove of the wire drive disc (Soudronic m/c’s only). Measure the copper wire elongation after the lower weld roll, or after the weld roll before the wire chopper: Elongation varies between 0 – 4% of the can body height. 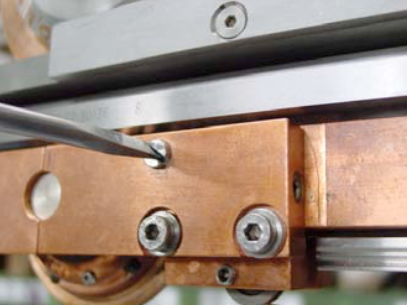 A sufficient copper wire tension is important to avoid a sliping copper wire on the weld rolls! Set the overtravel according manual / scale on the transport carriage! Measure how many mm the can body will be pushed over the center of the weld rolls. Welding pressure for Wima welders vary between 35 and 50 kg / daN. Start with ~ 45 kg / daN. 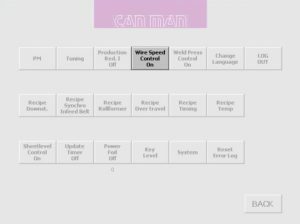 Check the manual to convert in bars. 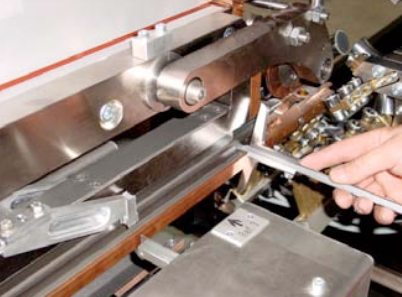 50 Hz welder using welding pressures between 35 – 45 kg/daN, while automatic welders running between 40 – 50 kg / daN. Reset the calibration crown if needed with the mandrel. The diabolo-rollers should not have any radial-play! Adjust the overlap according manual. Once the overlap has been set, double check and set the can gap. Increasing the overlap will reduce the can gap, decreasing the overlap will increase the can gap. Weld around 5 cans and measure the gap between the tin-layers. 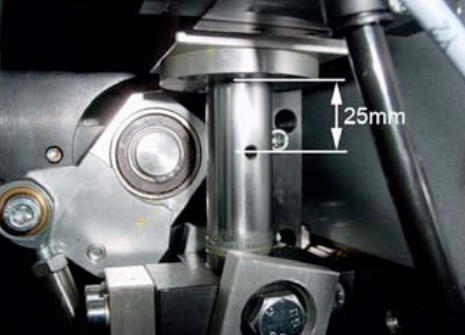 A good can gap measures between 1.5 – 3.0 mm. Any variation should be within 0.5 – 1.0 mm. Welders with a static frequeny inverter should have a welding spot length between 0.6 – 1.2 mm. A welder without static frequency inverter should be operated between 8 – 12 m/min. Reducing the welding speed does decrease the welding spot length. The welding spot lenght should always be as long as possible (by reducing the frequency) to reduce energy and heat in the welding seam and in the welder to a minimum. Main target must be a flexible and smooth welding seam! The main weld current must be set correct! Reduce weld current until cold weld zones appear. Tear-off test must be done at an angle of 30 – 45°, means try to pull-off the top tin plate edge. To be done from each side. Note the weld current value! Increase weld current until hot weld appears. Tear-off test must be done at an angle of 0°, means pull-off the seam only and find out when the seam starts to become fragile. Note the weld current value! Add 2/3 of the weld current difference between cold and hot weld seam to the cold weld seam value, and start the production! Set beginning and end time and beginning and end current! Note: If the welder is running with triangle wave-form, make sure the duty-cycle is between 80 – 90%. If the welder is running with sine wave-form, make sure the right transformer step has been choosen! Contact us if you are not sure. The seam-extrusion inside and outside must be equal! 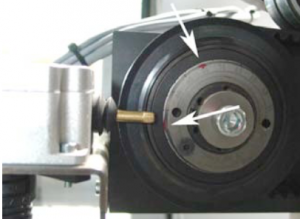 If the seam extrusion is bigger inside, reduce the height of the calibration crown. 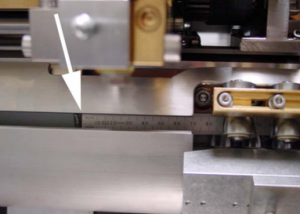 If the seam extrusion is bigger outside, increase the height of the calibration crown. The shape or roundness of the can-body is not so important as a correct seam-extrusion! The seam extrusion inside depend on the inner weld roll diameter as well: The diameter difference of upper and lower weld roll should be as small as possible. Micro leaks can occur within the seam and beside the seam – especially on cold-formed areas like necking, beading, flanging or seaming -, even if all above mentioned basic parameters & settings seems to be correct. 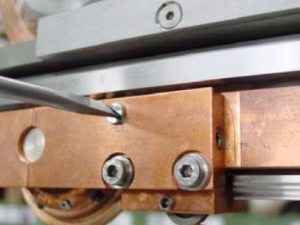 Micro leaks can have various sources: Wrong settings on the welder, tin-plate parameters which support such faults, worn or wrong machineries in the downline, or tin-plate parameters which do not fit to beader, necker, flanger and seamer. For a better visual understanding put the faulty-can bodies in a water bath, and inspect the leaking area by a microscope. Store the pictures if possible! Make sure that necker, flanger, beader and seamer are in good conditon, and do not stress the weld seam more than needed. 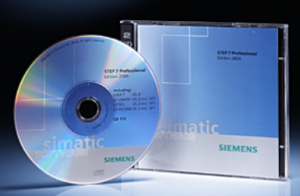 For further information check the manuals (check the tin-plate specifications range) or contact the supplier! Try to weld different tin-plates to understand which tin-plate parameter can be produced without such faults. Rolling-direction parallel to weld seam can increase the occurence of micro-leaks! 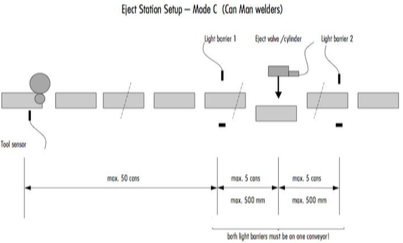 Reduce the welding frequency within the possible range (see point 13. in above checklist), and set the main weld current again (see point 14. in above checklist). 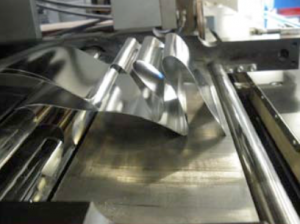 The production cycle (cpm) must probably be reduced to reach a good weld seam. Produce a certain number of cans and test them. Increase the welding frequency within the possible range, and set the current again. Produce a certain number of cans and test them. Reduce the welding pressure to max 45 kg / daN, and set the main weld current again (see point 14. in above checklist). Produce a certain number of cans and test them. Reduce the welded overlap by around 0.10 mm, and set the main weld current (see point 14. in above checklist). Produce a certain number of cans and test them. Increase the can gap to have completely different welded begin and end. Produce a certain number of cans and test them, and set back if it didn’t helped! Set a slight can-body offset, to bring the current different into the tin-plate. Produce a certain number of cans and test them, and set back if it didn’t helped! Empty the water tank. On 2-circuit cooling unit only cold water tank has to be emptied. Blow off one by one each cooling circuit in the welder. This allows to empty each circuit separately. If your welder has a 2-circuit cooling system only the circuit for the lower and upper weld roll has to be emptied. Change the filter cartridge and clean the filter housing inside. Fill the tank with water only, open main valve Y14, and run the system for at least one hour to flush rests of old emulsion out. Empty the water tank again and clean again if necessary. Fill the water tank with water (or distilled water if requested), and mix the PowerRoll™ coolant H1 in with 8 percent. Change the filter cartridge monthly. Change the cooling emulsion yearly. Use the PowerRoll™ cooling system cleaner at any time you change the emulsion. Use the PowerRoll™ cooling system decalcer after around 5 years. The error occures when there is a problem with the measurement of the wire speed (not wire speed by self). Check the gap between idler wheel and sensor, 1mm is recommended! Check the bearings of the idler wheel! Is turning smoothly? To much play can create an unstable gap to the sensor. 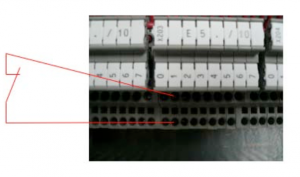 Check cable between sensor and plc! There you can find a second “Key button”. Push that button to reach the main setting window. Please note: The workaround described above is not recommended for permanent production! Overhead conveyor (OHC, TPO) not lowering anymore. Check first whether the conveyor / elevator unit is blocked somewhere! 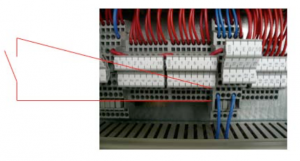 Check the 24 VDC fuse according electrical diagram. Make sure that the correct size will be used! Check the setting of the respective sensor (according electrical diagram), which allows the conveyor to move if the sensor is active / free! Take the 24 VDC motor out, and check whether the motor is defective or not! 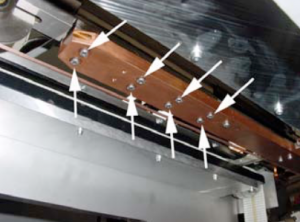 Make sure that the conveyor is not moving downwards as soon as the mechanical connection between motor and elevator unit has been released! Motor push finger do not start. Motor try to move and stop immediately. Servo-controller shows error P03. Resolver on the backside of the bodytransport motor is damaged. Check if the bearings are worn out! Resolver is not fixed well on the shaft. Wire break in the cable between resolver and servo controller. How to do an insulation check (yearly task)? Turn the main switch off, make sure the water cooling unit is also off! Take off internal side seam tubes or internal oxyde tube.  Tubes have to be insulated in the area of rollformer, to avoid any contact to the ground. (In the area of the lower welding arm is a simple insulation not possible). (Do not forget to place back after you finish). − Clean the whole secondary circuit as good as possible by rag and compressed air. 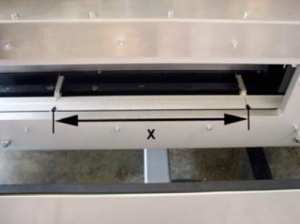  Blow from rollformer side towards overhead exit conveyor, to protect the bearings in the rollformer. Take off the lower welding arm. Dismount the main Z-bar including front nosepiece. 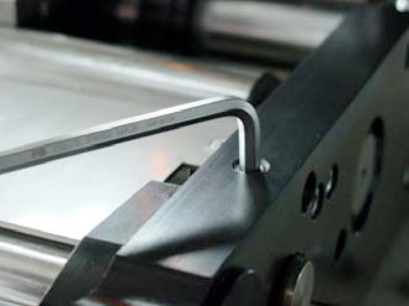 Clean both Z-bars, the Z-bar slot in the arm carefully, without using grinding paper, to avoid increasing theinternal width! Check internal/external full ceramic cross bars for damages, no need to take them off, if they are ok.
Clean the contact surface between arm and the copper plate going to the welding transformer with grindingpaper 400.  Use a little flat plate and fold the grinding paper around. − Mount the Z-bar back into the arm and measure the insulation by Ohm-meter > 10 Mega Ohm!  We recommend to use a special heat compound to guarantee a better heat transfer from the Z-bar to thewater cooled welding arm!  We recommend to use new insulation washers (recommended also on all others). Check the little yellow full ceramic idler wheel in front of the lower welding roller, make sure screws/nutsare locked, and the circlip is not missing! Clean also the upper slot in the upper power plate. Take off the top copper plate between welding transformer and upper power plate (support of the lowerwelding arm). Clean the plate and the brown insulation plate (take care, can easily be broken). Clean all areas around the upper power plate, especially the area between power plate and copper plategoing to the welding transformer. This area is difficult to reach, when the lower arm is build in. 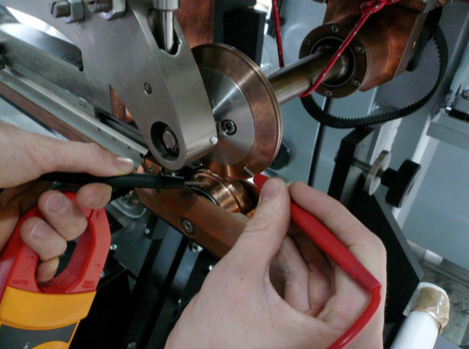 Clean the area around the big copper plate (going around the shaft of the upper pendulum rollerhead). 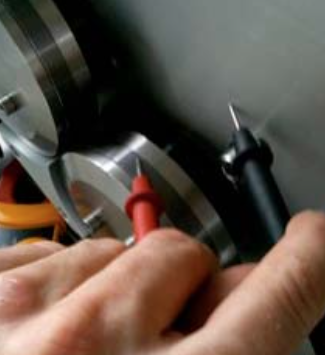 Check following insulations (Ohm-meter > 10 Mega Ohm): Each idler wheel to the aluminium plate.  Check also every bearing. Attention: Most of them have ceramic balls, marked by a red point! Each body of the copper profiling unit to the aluminium plate. The body of the big cooling wheel to the aluminium plate. The twin idler wheels (between rollformer and upper power plate) between itself but also to the aluminiumplate. Both transport rings, cutting wheel and pressing bearing/ roll of the wire chopper to the aluminium plate(clean up before may be helpful). The upper power plate to the main aluminium plate. The front support of the pendulum rollerhead to the aluminium plate. The welding pressure cylinder to the supporting plate. The main aluminium plate to the machine frame. The pendulum rollerhead to the machine frame. 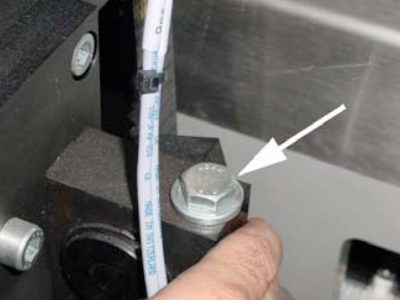 Calibration crown: Clean the calibration crown first. Each diabolo roller to the main brass plate. 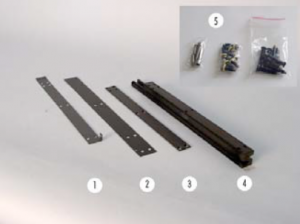 Take off the whole canbody guidance including the long aluminium supporting plate (T-shape). 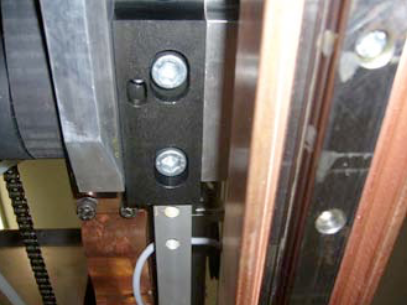 Check the insulation between the long steel guide plate and its supports mounted to the frame:Three brown insulation plates underneath the long steel guide plate. 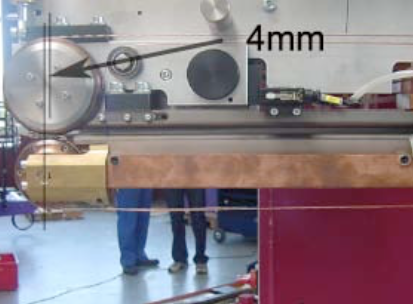 Two separate brown insulation plates underneath a long steel bar (30/60 x 40 x 400 mm), to be found on the machine frame, in the area below the calibration crown. Put now back all parts. 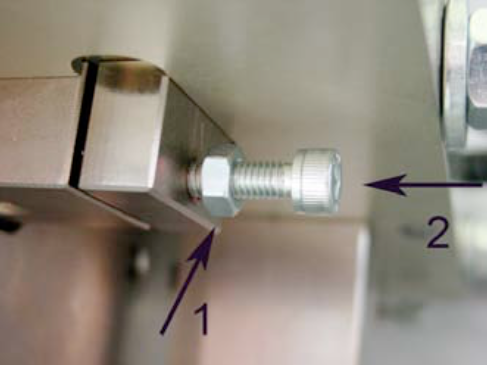  Make sure you are using only stainless steel screws and washers and lubricate the threads again! Bad insulation of the G-sensor to the bracket. This can cause errors to the PM board. Open the housing of the bracket and insulate the G-sensor properly. see also Pacemaker FAQ “PM send error” / “PM receive error” or welding parameter don’t match after starting the machine. Must be 1 mm behind tin plate edge! Adjust roller clearance on all 7 pairs according manual. 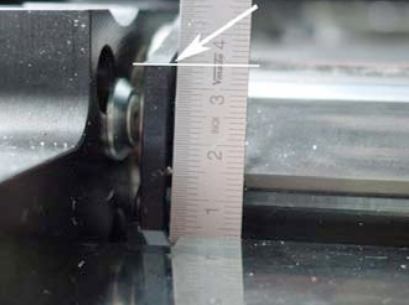 If you can’t get 0.1 mm roll clearance, check the toothed gears inside/outside. They may have a wrong lateral position; that ends in a too big clearance between the shafts! Take off main and inner timing belt, rollers touching each other, all gears must have slight play! Form of canbody must be round, both edges must have a parallel overlap, depending on the diameter! 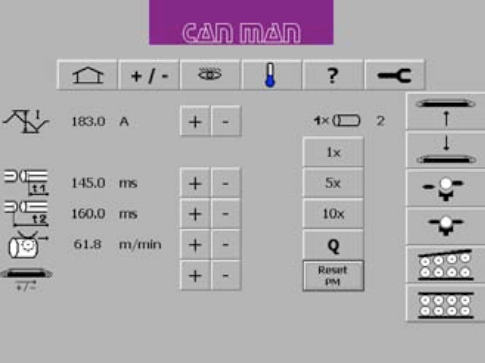 Check the feeder angle and rollformer speed according the recipe of the canbody you are currently running. Check the curve you have in the tuning window with the recipe of the canbody you are currently running. 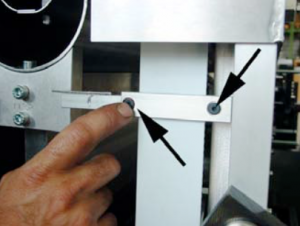 Make sure you have mounted the correct pair of final pusher fingers (see the diameter range engraved on the fingers). Check the actual overtravel with the help of the manual. 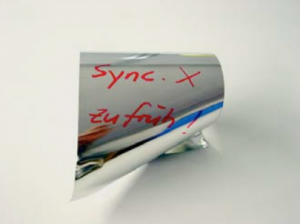 The recipe helps to adapt the speed of the incoming can into welding roller and the actual welding speed. In the best case, those speeds are equal. Below you find a table of this recipe in steps of 10 mm can height. 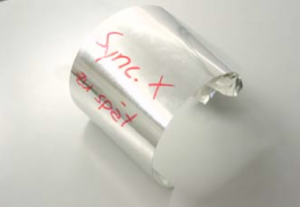 Turn the wheel of the synchrostar, that the pusher finger is as close as possible to the welding roll. Measure now the distance from the top of the pusher finger to the center of the welding roll. This problem occurs, if the main switch of machine is turned on, but the machine is not running production for a longer period. The cooling plate of servo drive is heating up, because the water valve is turned off during this time, to prevent condensation water. Turn off the main switch, if you don’t run the machine for a longer time. To get rid off the error with overtemp. servo drives you can go to the „Tuning page“. Press the button to switch on the main valve for the cooling system manually. Keep this button pressed for a few minutes, the system will cool down and you can start the machine normally. If you close the “Tuning page”, the main valve is switching back to automatic mode, controlled by „Production ON/OFF“. Control “ON” function does not work. Drives do not go to reference position. No message displayed. 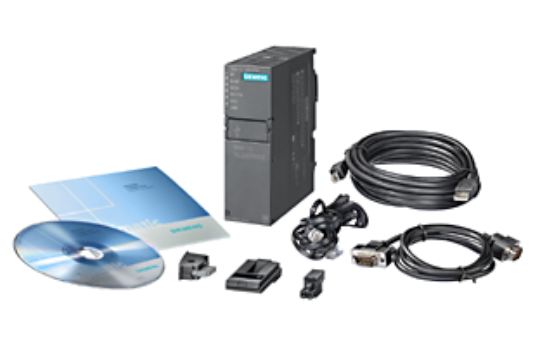 Drives for the height change magazin and infeed system are active and stopped before reaching the position – overcurrent active. Go to the mask for height change, push the reset button and the start button. The drives must reach the position without overcurrent message. If the error comes again, check the free movement of mechanical system. 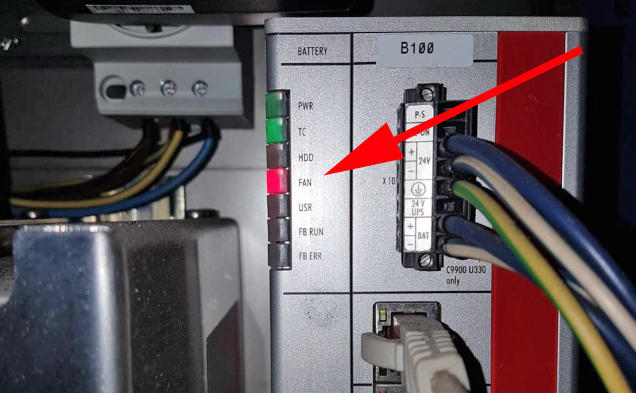 If “SF” and “BF” on the PLC are “Red”, some drives on profibus are missing (no connection of height change position drive to profibus). End resistant of all profibus plugs must be “OFF”, only first and last plug “ON”. 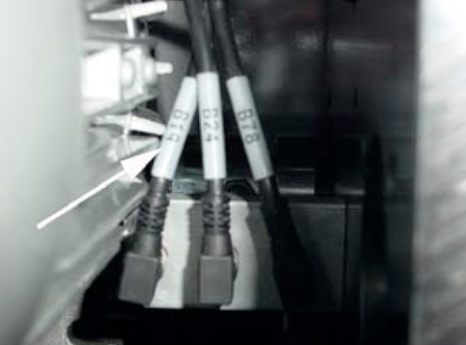 Open the profibus plug on height change positioning drives, then open and close again the connectors! 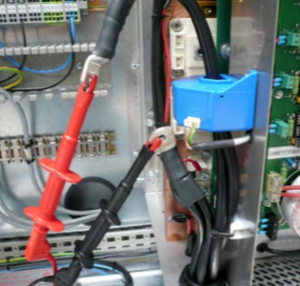 Check the profibus module for damages or bad contacts! The welding seam looks like the welding frequency is wrong. Heavy vibration (spatters) and noises during welding. Check the wire groove, maybe the profil is not straight anymore (see also if short near the seam). Check the tension the belt for the profiling unit and pendulum rollerhead. Servo drive transport belt: Check if the whole transport belt unit is vibrating during positioning. 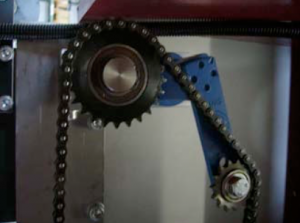 If yes: Change the drive gear on top the servo motor. 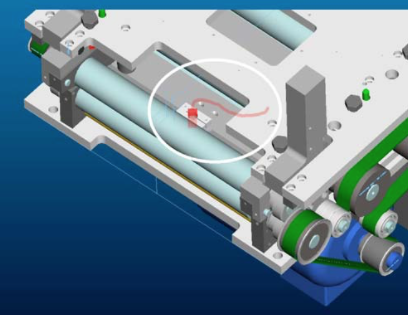 Since the slider of the linear motor contains strong magnets, remove dust or small particles from slider with a disposable paper. Make sure that you have a clearance of 0.1 – 0.2 mm between the pusher plate and the vacuum plate. Take out the bottom gear inside. Take out both gears outside (motor side). Adjust the inlet shaft clearance 0.10 mm. Mount both gears outside again. Move the upper gear outside laterally, till you feel a play between the teeth of both gears! Don’t mount the bottom gear inside anymore, you don’t need it! Lubricate the gears outside with a special gear lubricant (can be ordered from Can Man / article No. 006950). Check the air pressure on the small air regulator, the value must be around 0.5bar (pressure to engage the clutch). refer also to the touch screen “Air” symbol, where you find the exact values. refer again to the touch screen “Air” symbol. 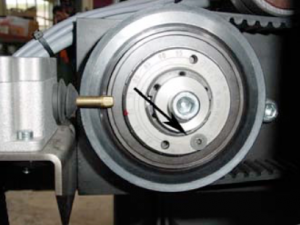 Check whether the safety clutch is engaged or not: Turn the synchrostar by hand, and see whether the motor is also turning or not. If yes, the clutch is engaged! Check if the LED from the sensor is OFF. If the LED is still ON, turn the sensor a quarter turn counterclockwise, or until the LED is OFF. Do not turn the sensor too much counterclockwise. If the distance is too big the clutch does not stop the machine in case of a crash. To test you can adjust the precision air regulator of clutch to „0“. Now the clutch is disengaged and the sensor has to be ON. Turn the synchrostar and make sure that there is no resistance coming from the sensor/clutch! 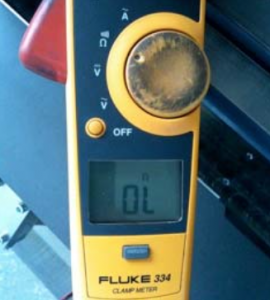 Check the welding pressure: Display > 35 daN! 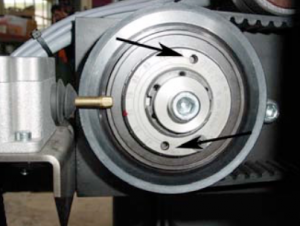 Both supporting bearing underneath lower rollformer roller are broken. Take off the roller, and check each bearing, if needed exchange them with new ones. 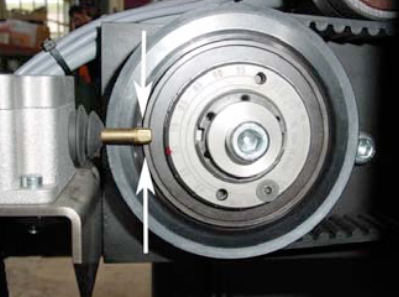 The shaft clearance and/or pressure of the last rollformer roller pair (bending station) is not correct. Check whether the lifting motor has enough play after the rollformer is locked or not. If not, the motor may have a wrong internal micro switch setting. Make sure the rollformer is locked. Completely unload the springs on both sides till each spring has an axial play. 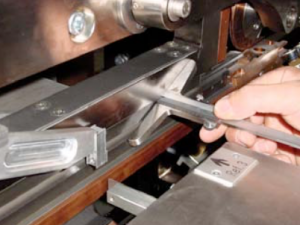 To ensure that the roller is easily moving up and down, lift up each end of the roller by hand. 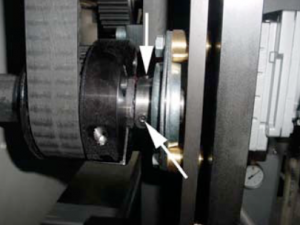 Belt tension inside does not effect conical rollforming! Reset roller clearance to 0.1mm by feeler gauge. Check the clearance with two gauges on the very left, and on the very right end of the roller! Turn both springs clockwise till each screw touches the spring. Load each spring by 2.5 revolutions. Check with two gauges on the very left, as well as the very right end of the shaft. After that you should be able to get a proper rollformed body, with an overlap of 5 mm. How do I check the overtravel? Below you find a table of this recipe in steps of 10 mm in can height. Turn the wheel of the synchrostar, so that the pusher finger is as closeto the welding roll as possible . Now measure the distance from the top of the pusher finger to the center of the welding roll. 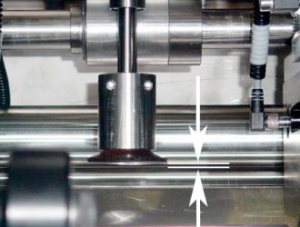 The position of the welding roll (WR) has an influence on the overlap at the beginning and at the end. What kind of oil and lubricant do we need for our X1 welder? The center of the calibration crown (tooling) should be X = 2 – 3 mm behind the center of the pendulum roller head. To adjust the position, tip the „tool out“ symbol. Then you have to loosen the two M10 screws on top of the tooling plate. Then you loosen the M6 counternut (1) below the plate, then you can adjust the position with the M6 screw (2). 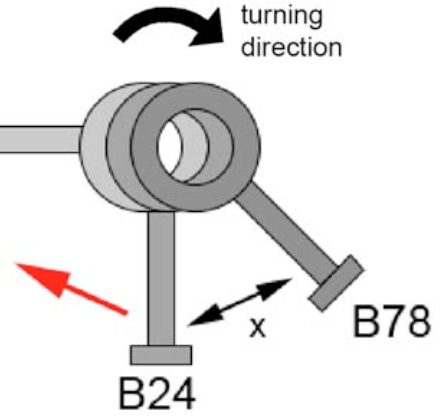 When you turn clockwise, you will reduce the distance, when you turn counterclockwise you increase the distance between the calibration crown and the pendulum roller head. Tighten the counternut (1) again and then tip „tool in“ to check the position. X = 82 – 83 mm. What is the requirement for remote maintenance? In the electrical cabinet a modem with a remote maintenance adapter is integrated. 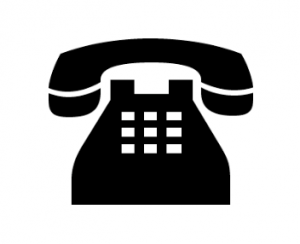 Therefore you can do small changes over the phone line. Recommended is an analog phone line with a direct phone number, with no internal connection through a switch board. Disconnect the phone line, if not in service! The remote maintenance system depends on a very good quality phone network. A bad network will make the service impossible. How can I update the X1 PLC software? There are two possibilities to do maintenance work or updates to the PLC Software. 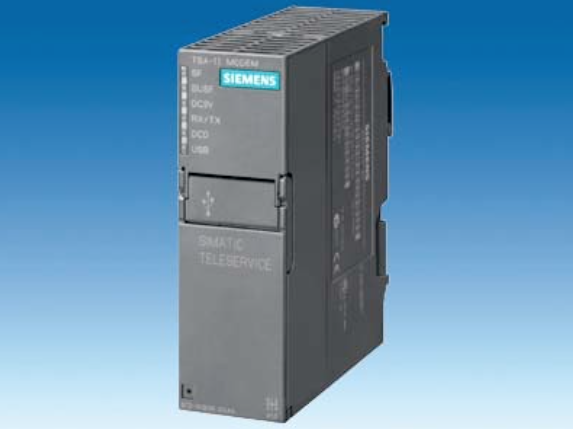 The Siemens PLC is programed by the Siemens PLC Software Step 7TM, the panel (Touchscreen) by WinCC flexibleTM. knowlegde of Step 7TM + WinCC flexibleTM. If you change the software without prior consultation of CAN MAN, the works guarantee becomes void. The movement (the back and forth) of the wire and the final wire break happens, because the analog signal is right on the threshold to start. You can solve the problem, when you increase the „Hertz“ setting of the frequency converters U4 and U6. Place the programming display on the converter U4 and change the parameter C19 from 5Hz to 7Hz, and do the same for the converter U6. A second reason for this phenomena could be the incorrect position of the analog sensors B1 and B2, see the following description, which is explained for the CM X8, but is valid also for the other automatic welders. The timing of the rounding process is too late. The rolled can body is clamped or caulked in the catch station. One or more transport fingers is / are twisted or lost. The tension of one or both transport finger timing belts is too low. Check the transport finger’s offset. The final pusher fingers of the Synchrostar are taking over the can body from the transport fingers too late. 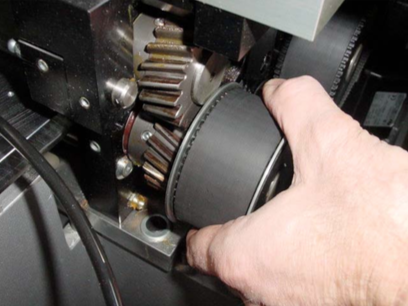 The precalibration is set too tight, or some precalibration rollers are not easily turning anymore. 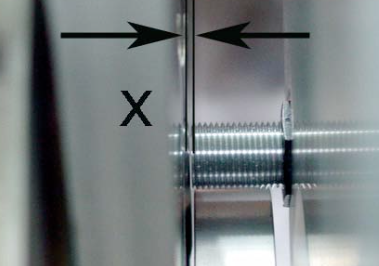 Check if any groove of the z-bar section is worn. Take the wire and switch out of the air supply. Can you smoothly move both cylinders of the wire drive? Check all rolls of wire drive system. Turn them by hand. All bearings ok? Remove the belt of the motor for pendulum roller head and turn them by hand. Is it turning smoothly? Check the same on profiling and chopper unit. Now install the belts and tight them correctly. Put in the wire and adjust the air regulator. Cylinder wire profiling unit 1.5 bar and cylinder wire chopper unit 2.0 bar. Change the selector switch to “wire manual” and run the wire. Take a look at welding rolls – is wire position correct? Check profiling of copper wire, correct width and constant? Weld a can with current and without current. Wire break? Have you changed the wire? Use the old one to compare. Check the tin mark on the wire. Ok? Don’t forget to lubricate the profiling unit and chopper unit. Tool sensor temperature jumps up. Machine shuts off. Error Temperature difference too big. Tool plug not properly connected. Blow out and dry the plug. 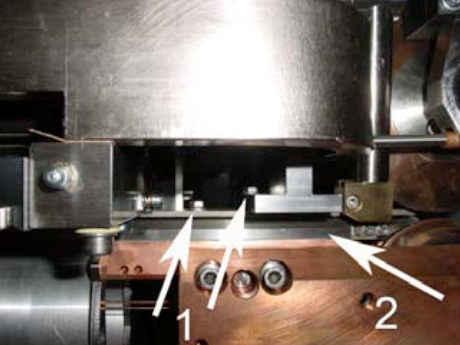 Short-circuit from the diabolo rolls or precalibration to the mounting plate. Due to the temperature sensor cables, which are guided through mounting plate, an error message could be triggered through induction. Dispose the short-circuit and clean the tooling from welding spillings. Use a contact spray. 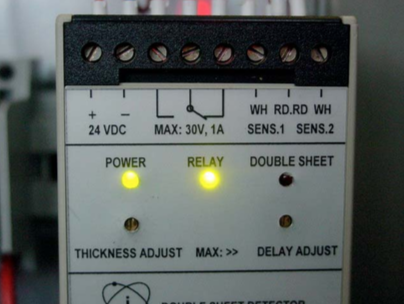 How to connect external signals to the X1 welding machine? 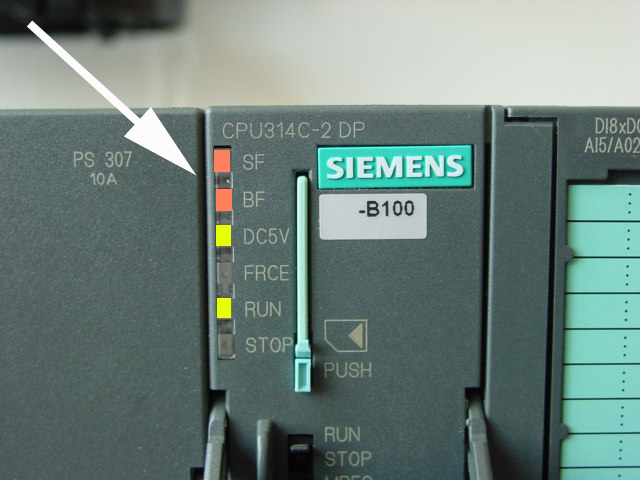 In order to switch off the downline due to an error, the PLC has a prepared input. To use this input, we need a potential-free signal from the downline, which is closed when the line is ready. Use the terminal E5.1 to connect the line control. 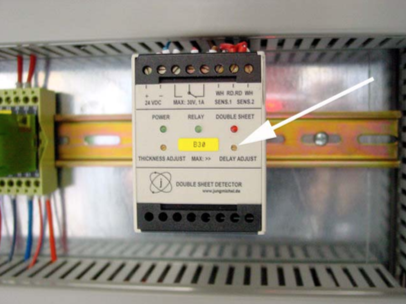 As soon as an error occurs, the destacking of the sheets stops and after an adjustable delay the wire-run and the remaining drives. The canbody transport continues to run slowly. 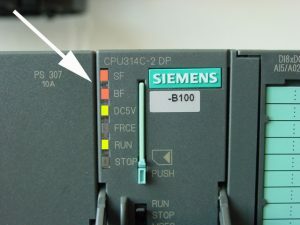 This mode plus the flashing of the key „Production ON“ shows the operator the status of the line stop. Machine begins to produce independently again, respectively after the release of the line control. This input should be connected the same way as the line control. Here as well we need a potential-free relay contact of the powder unit. But this contact needs to be open, if there is any error. This signal needs to be connected to E126.7. The production shuts off, if an error occurs. After that the operator needs to switch on the machine. In order to switch on the powder, we provide a change-over contact. 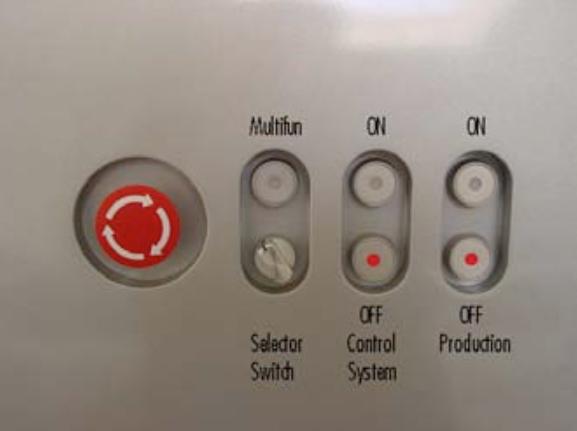 The contact switches as soon as the production or a single can is triggered. 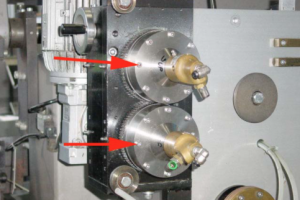 In order to provide enough time for the initialization of the powder, the destacking is delayed by an adjustable time. Before you connect this signal, you have to remove the comb bridge (1) and the link (2), in order to make the contact potential-free. Use the terminal K6.2 (A124.2). Consult the electrical scheme of your welder to double-check the various input signals. In case you are not successful with the connection, contact a CAN MAN electrician. Qualimaker (QM) does not show a graph, after Start scope has been activated! The reject does not memorize the canbodies and all cans are rejected. The setting of t1 and t2 is wrong. If the timing is wrong the PM cannot execute the signal, which is necessary to memorize the canbodies in the reject unit and to start the record of the graph. t1 defines the starting point for the reduced current time window. t2 is the time, where the reduced current windows ends. t2–t1= thus is the timespan for the reduced current, therefore t2 > t1! The value of t2 and t1 needs to be smaller as the cycle of one single can. A production of 300/min. corresponds to a cycle time of 200 ms/can. Production of 600/min. corresponds to 100ms/can. For a more detailed explanation of timing t1 and t2, consult your manual book 2, chapter 5.6.5. “Setting of Parameter t1 & t2 for reduced Current and Overlap Check“. Check the inductive proximity switch B64 at the final pusher unit for function, operating distance and defect. Final pusher (Synchrostar II): Sensor B64. Inductive proximity sensor for embeddable mounting. Check the tool switch B6 in the calibration tool for function, operating distance and defect. The position of the welding sensor B6, can be almost flush. Just make sure that you do not get scratches on the canbodies. The height of the sensor can be adjusted here (see arrow). Do you have a Linmot error code list? Emergency stop must be released. 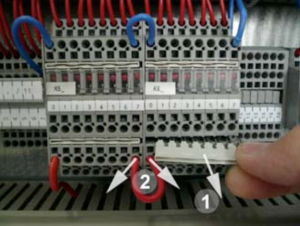 Check setting of all DIP switches on the Lenze bus module and on the Linmot controller. You can find the correct setting on the wiring diagram. Check all switches on the complete bus system. Seriously follow the cable from PLC to the last slave. First plug and plug of last slave must be set to ON, all other plugs to OFF. 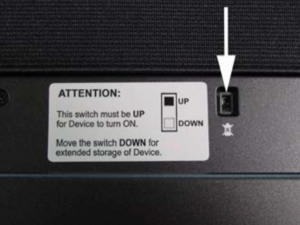 The PowerCONTROL™ (touchpanel) only works in the docking station, but not if you remove it. Check the position of the switch! The internal battery is defect! 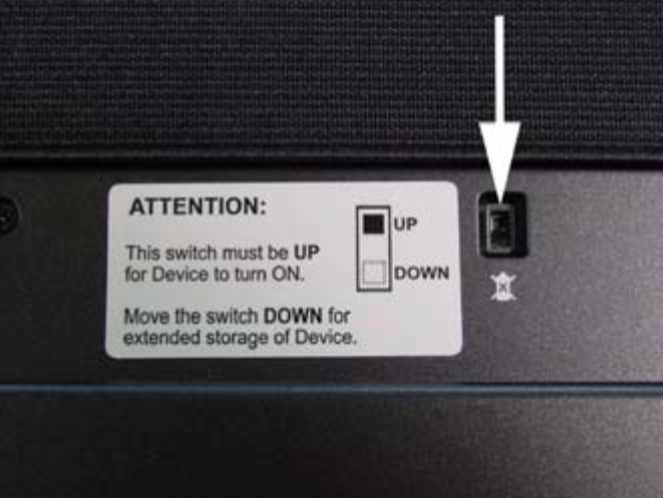 If you do not use the panel for a longer period (several weeks), the device should be turned off on the backside. Otherwise the internal battery will discharge and will get damaged! If you push the button on the right side, you are able to see the status of the integrated battery and optional available second battery. The optional second battery is located at the back of the device. There are no support entries for your selection.